Moving away from the hand controller on an equatorial mount can seem daunting at first but is ultimately a very rewarding experience when you realise all the possibilities it unlocks. In the past months I have seen a lot of people posting on groups and forums asking fundamental questions such as how to get their mount connected to their computer via USB to control it from the computer. This tutorial is aimed at guiding people through this process. Ultimately we will need to download and install a number of drivers and programs, which are all free in this particular case. Links to each are provided within this tutorial. You will also need a cable that can connect your mount directly to a USB port on your computer, or a mount that connects your hand controller to your computer. In the former, the hand controller is no longer in the equation (this is ideal) and a good number of popular mounts have dedicated cables, such as the EQDirect series of cables for the likes of the Skywatcher HEQ5 and NEQ6 mounts (or related ones such as the Avalon M-Uno). In the latter, the hand controller will either auto-detect a connection to the computer or the user can set a PC Link setting active. This may disable the hand controller's main functions and allows the computer software to take over. Do keep in mind that in this case, certain settings on the hand controller will still interfere with your computer control, such as autoguiding speed. As computer-control of astronomical equipment reached the hands of amateurs and the market got increasingly saturated with equipment choices, programmers ended up making an open-source platform to allow all the equipment to communicate with the computer on a common platform. This was called ASCOM, short for AStronomy Common Object Model. Installing ASCOM is essential and in fact the most important step in getting your equipment computerised. This can be download for free from the ASCOM website (click the Download button on the right). With the ASCOM platform installed, your computer will be ready to have other devices installed on to it. Specialised astronomical equipment such as CCD cameras, autoguiding cameras, filter wheels, etc, all have their own ASCOM driver that will install itself to allow you to use pretty much any program to control that device through the ASCOM platform you just installed. Next, we need to install what will essentially replace the hand controller in a virtual form on your computer. 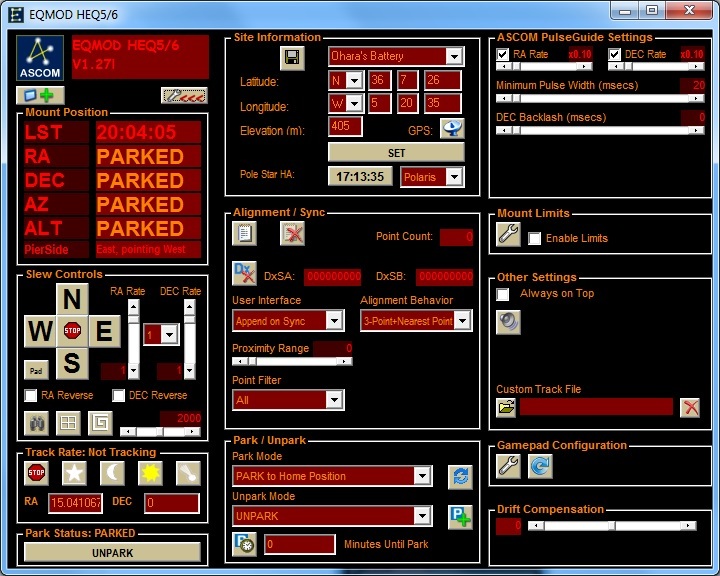 This is EQMod, another open-source program created with the idea of controlling mounts through the ASCOM platform with a program interface rather than the hand controller. EQMod can be downloaded for free from the EQMod website (download the latest version on the list). The installation will add a number of shortcuts to your computer, and later we will look at the best one to use EQMod​. 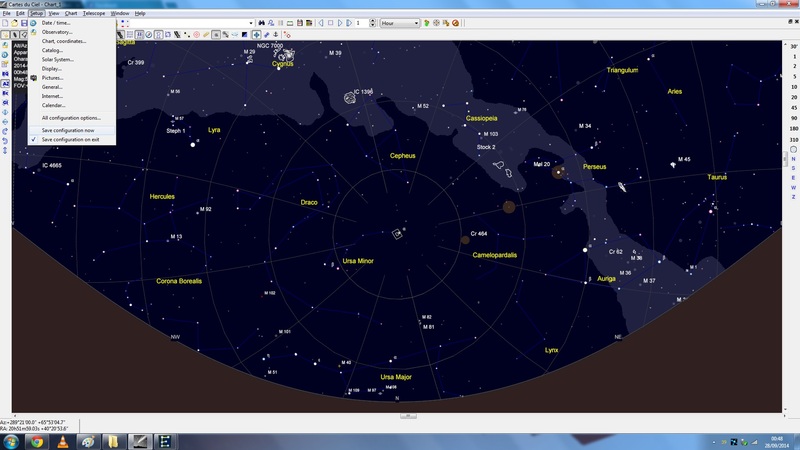 With EQMod installed, we will be able to physically connect to the mount, slew it across the night sky, polar align, manage its star alignment (for more accurate Goto) and manage autoguiding response. This is a critical tool to computerise your equipment and completely replaces the hand controller. The only missing feature is a planetarium for Goto. This is the job of Stellarium or Cartes du Ciel - it is ultimately your choice which to use, as both are excellent, well known and free. If unsure which to use, go through both section 3.1 and section 3.2. If you are only interested in Stellarium, go through section 3.1 and skip section 3.2. Vice versa if you are only interested in Cartes du Ciel. Now that both the ASCOM platform and EQMod are installed, we have everything we need to connect to the mount and so we proceed. One of the primary ways to connect a mount to a computer is using a compatible EQDirect cable. 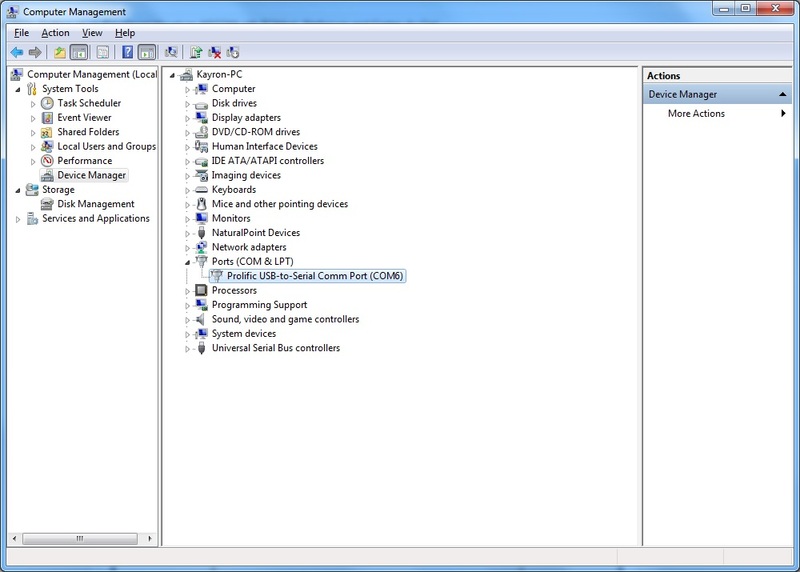 This quite simply interconnects the mount's serial port to a computer's USB port, with an interface that works with the ASCOM platform to communicate with software on the computer. If such a cable is not available for your mount, some mounts are also able to be connected to a computer through the hand controller supplied with the mount. In this scenario, the hand controller acts as the ASCOM platform interface and allows the user to issue commands all the same, bypassing the hand controller (though some settings on the hand controller may still apply, e.g. autoguiding speed). 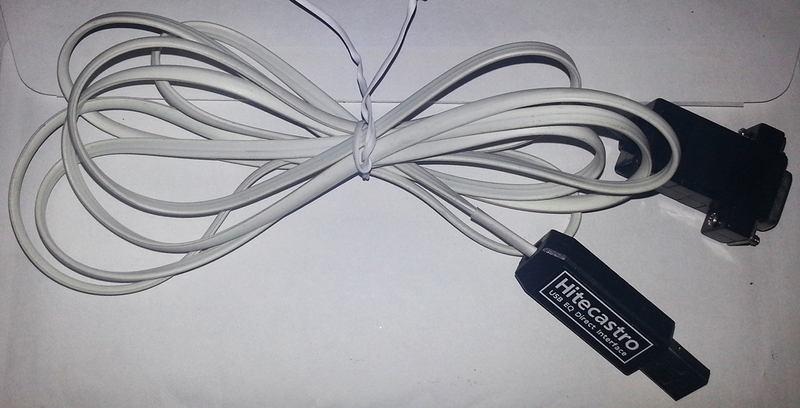 Connection of the mount through this cable provides direct ASCOM control of the mount from the software on the computer. When the cable is connected, automatically (even when no power is going to the mount), the computer detects the cable and installs the drivers. It is important that the correct drivers for your cable are used in the installation. We start by running EQMod. 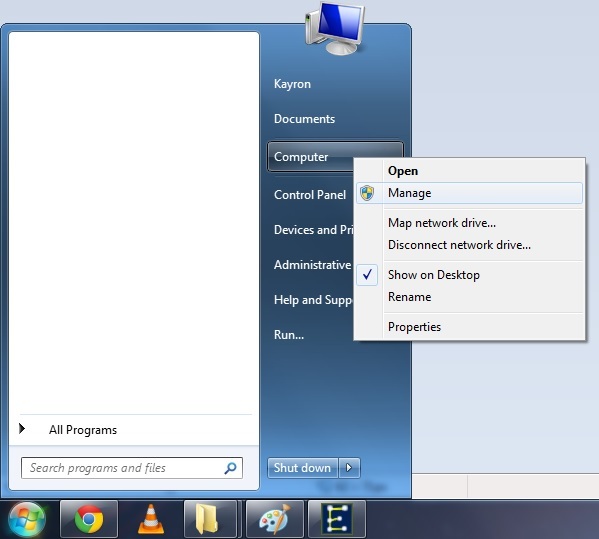 You will find multiple shortcuts in your Windows start menu to run EQMod. The best one to use is called Toolbox. If you cannot find it for any reason, navigate to the EQMod folder (default installation directory is seen in the screenshot below) and find the file called EQMOD_toolbox.exe. On running this, you are greeted with the following window. Since the ASCOM platform is already installed, we first click the Register button. This need only be done once (the first time we run EQMod). 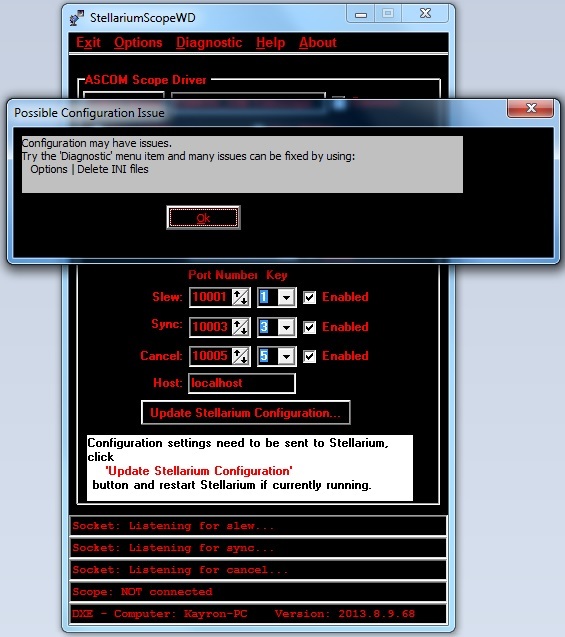 If there is an error, check your installed programs list and uninstall any previous versions of the ASCOM platform, as there could be multiple (e.g. the program Starry Night does at times install ASCOM 5 as part of its installation, when we do not need it because we already have a later version installed as part of section 1 above). On clicking Register, we should get a simple message notifying of success. 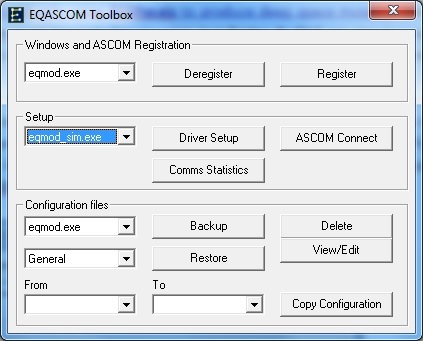 Just in case we wish to use the ASCOM EQMod Simulator at some point (details explained later), we can select eqmod_sim.exe from the top drop-down list and click Register on that as well. Once done, we re-select eqmod.exe from the top drop-down list. We will need to configure EQMod to communicate with the mount through the correct COM port. When you first connect the EQDirect cable, Windows will power up the USB device and install it, even if the mount still has no power. At this point, Windows assigns a COM port number to the EQDirect cable. This is quite literally the port number the computer uses to communicate with the mount. If you use the same USB port from now on, it should not change. We will however need to check which COM port number the mount is connected through. 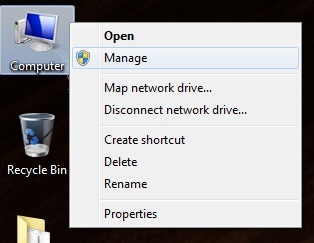 To do this, we simply right-click on Computer / This PC in Windows, and click Manage. This is accessible through the Computer / This PC icon on your desktop and also through your start menu (depending on your version of Windows). The above is on Windows 7. Ultimately, the following window should pop up. Here, we click Device Manager from the left menu. The EQDirect cable is listed under the heading titled Ports (COM & LPT), so we expand this to reveal the cable listed in there as an installed and functioning device. The important thing to note here is the bracketed COM port number - it states COM6. Noting this down, we move on to EQMod and close the Computer Management window. With eqmod.exe selected under Setup in EQMod's Toolbox, we click the Driver Setup button. The most important thing to do here is to select the correct COM port number. EQMod will not find it by itself by clicking the Search button - it will likely just say Not Found (as above). From the bottom drop-down list under EQMOD Port Details, we select the correct COM port number. For myself, this was COM6. Under Site Information, we can also enter the GPS coordinates of the site we are setting up in. Simply select a slot from the list, enter a desired name, enter the relevant GPS coordinates and elevation and click the Save button. You can save many sites under this and when you start up EQMod, these will be available for selection and quick setting. It is important to have the correct GPS coordinates for your set up location. There is not much else we need pay attention to in this setup window, though there are a few settings worth noting. Under Guiding, ASCOM PulseGuiding and ST-4 are available. This is the default autoguiding method that you wish to use if you are into astrophotography and are performing autoguiding. ST-4 is the standard method whereby the autoguiding camera is connected to the mount through a simple ST-4 cable. ASCOM PulseGuiding does not require this direct cable connection because the autoguiding camera communicates with the mount through ASCOM, and in a sense mixes in with EQMod in terms of communication. Under General Options, you will find Allow Auto Meridian Flip. This is generally not recommended, particularly if you are into astrophotography (unless you really want to use this feature). It does what it says it does - auto-flips your mount when it reaches the meridian. This would no doubt interrupt your imaging run and you may well prefer to finish an exposure, flip it yourself and then continue imaging. Ultimately it is up to you, of course. Though the defaults are good in my experience, you may wish to alter or embellish the list of Slew Presest Rates by adding more and/or customising the slew speeds for different available setting slots. Experience will tell you whether or not this is worth changing. Once everything is customised to your liking (at the very least the correct COM port number is selected), click the large OK button on the bottom. At this point, all we have left to do is make sure there is power to the mount and then click the ASCOM Connect button on EQMod's Toolbox. If the correct COM port was selected, the mount is receiving power and the voltage is high enough for the mount, you should be welcomed with a high-frequency buzzing from the mount and the EQMod window. In any case, click ASCOM Disconnect before checking the COM port number and/or the power supply for the mount and trying again. Once you are connected to the mount and EQMod is working, you can expand its controls by clicking the button on the top-right with the wrench and red right arrow icon. At first this expanded window may seem intimidating but there is little to it as you only need to pay attention to a couple of things. Under Mount Position, you will initially see Parked flashing. In general though, this section displays the current coordinates of the mount in terms of Right Ascension and Declination. Below it are the Slew Controls, which act as your hand controller in terms of manually slewing. To speed up the slewing, simply click the drop-down list to the right of the East button and select one of the presets. These are the numbered presets we saw in Driver Setup earlier and they can be customised in terms of how many there are and also how quickly each one slews the mount. If you are slewing or tracking and wish to stop entirely, simply click one of the two Stop buttons found on the left side of EQMod. Before being able to go to any target or slew however, you must unpark the mount and the button on the bottom Unpark is the one to click. Once this is clicked, the Parked message will stop flashing under Mount Position. At any point, you may also click this button again to Park the mount (back to the home position). This is usually done prior to disconnecting EQMod, unpowering the mount and packing up the equipment. Under Site Information, we can select one of our site presets (configurable through Driver Setup) or enter the GPS coordinates and altitude manually. Once selected however, we must click the Set button to ensure they are set. The button with the time for Pole Star HA is important when using EQMod to assist in polar alignment. The process of this is beyond the scope of this tutorial and the reason for it is simple -EQMod's website already has an excellent PDF step-by-step tutorial on using EQMod for polar alignment and it is viewable here (click link). This is strongly recommended if wishing to perform a good polar alignment. Though it will not beat a drift alignment, it can be very much sufficient (depending on astrophotography setup and exposure lengths) or even just serve as a precursor to a drift alignment. Under Alignment / Sync, EQMod displays how many alignment points we are using for Goto accuracy. Mount hand controllers tend to guide users through a star alignment process. 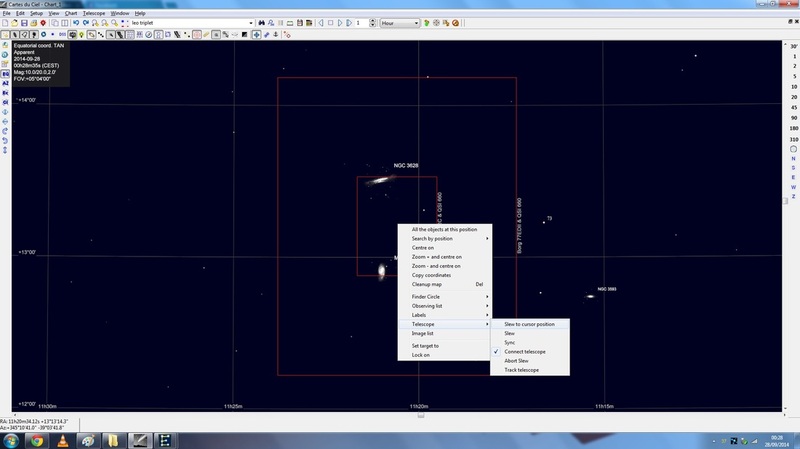 We can actually do the very same process with EQMod and Stellarium / Cartes du Ciel. By asking to slew to a star, manually centering it using EQMod's slew controls and then issuing a Sync command, EQMod saves the alignment point information and increases the Point Count by 1 each time a Sync command is issued. 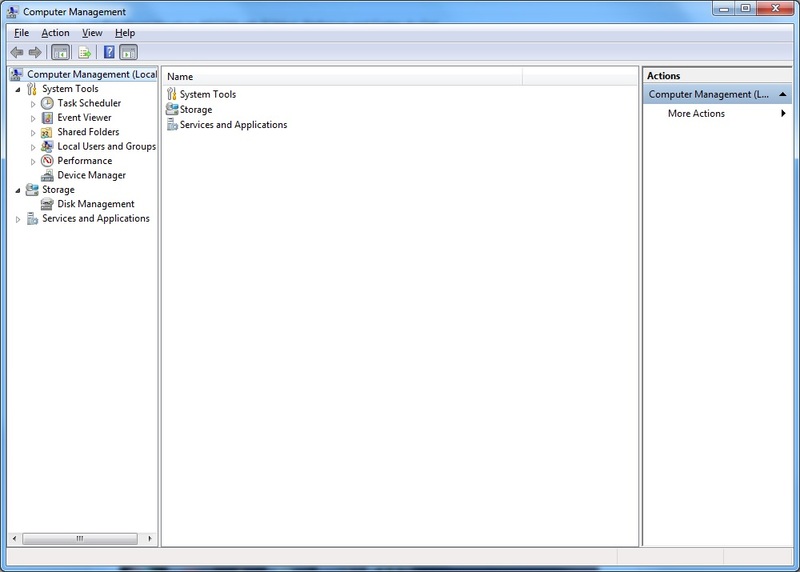 This is as long as Append on Sync is selected from the User Interface list (which it is by default). You can basically align with as many stars as you wish. ASCOM PulseGuide Settings can be tweaked in order to get the most out of your autoguiding performance. Default settings tend to do a good job but analysis of the autoguiding curve can be useful in order to tweak these settings for optimum performance with your mount. Autoguiding speeds in Right Ascension and Declination can be tweaked, as well as Backlash. You may find recommended settings for your mount online, or you may tweak it yourself. The analysis of an autoguiding curve for tweaking these parameters is however beyond the scope of this tutorial. Just as a pointer, if using ASCOM PulseGuiding, you may click the button on the top-left corner of EQMod with the green plus icon a couple of times to alter what is displayed under Mount Position. You can make this display ASCOM PulseGuider Monitor instead, which shows you the autoguiding curve for both Right Ascension and Declination, allowing you to tweak to your heart's content. Interestingly as well, on the subject of the changing what is displayed under Mount Position, if you click the button only once (from the Mount Position display), you get the option for Force Flipped GoTo. 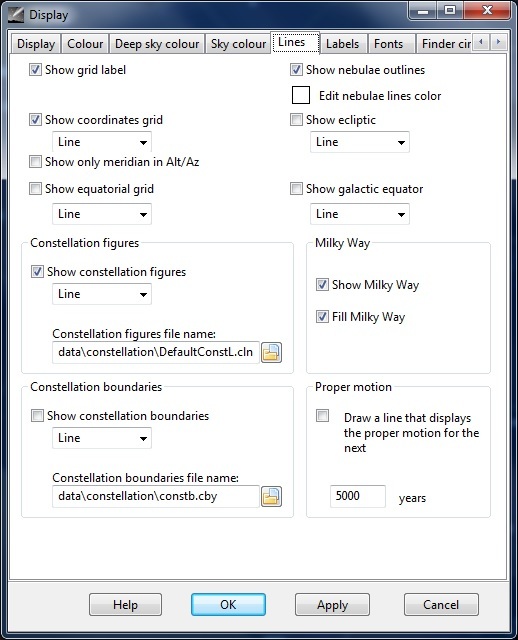 Ticking this box and issuing a Goto command to a target in Stellarium / Cartes du Ciel will in effect ensure that the Goto is done in flipped meridian mode. This will essentially force the counterweights to point upwards. This is only really useful if you are issuing a Goto command (e.g. for imaging a mosaic) and do not wish the mount to perform a meridian flip since you have already passed it. Please note however that when you tick the Force Flipped GoTo box and issue the Goto command, it will automatically untick itself once the Goto command is completed. You will need to re-tick the box to perform another flipped Goto command. As a final recommendation, I would leave the box Enable Limits unticked to disable the limits. Limits are in place to stop the mount slewing beyond the horizon. However, when performing a polar alignment in EQMod, as per the official step-by-step tutorial linked above, the mount will need these limits disabled in order to position itself in a way that you can polar align. Moreover, you may not want the mount stopping tracking unless you want to stop it. Disabling limits simply gives you that extra level of control. 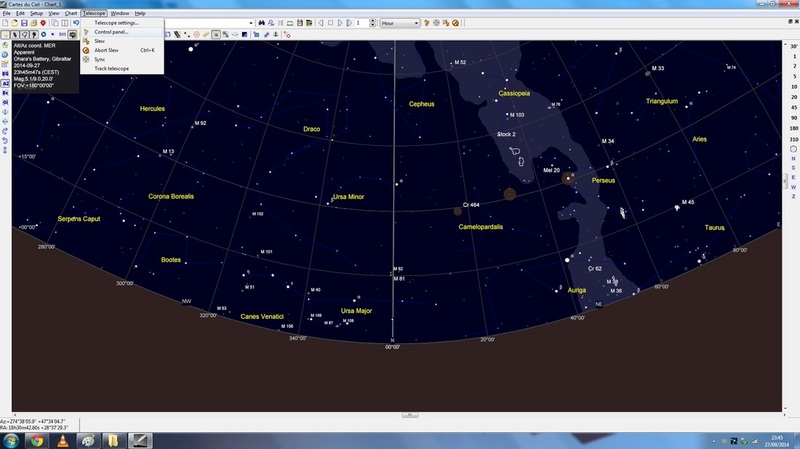 We will need EQMod connected and running, with the mount Unparked in order to proceed with Goto commands in Stellarium / Cartes du Ciel, which is the subject of the next steps of this tutorial (starting with the setting up of each). Please ensure that when packing up your equipment, you close Stellarium / Cartes du Ciel, disconnecting them from ASCOM, click Park on EQMod and once parked, click ASCOM Disconnect on EQMod's Toolbox, close that and then unpower the mount. Unpowering the mount while EQMod is communicating with the mount has led to the famous Windows' Blue Screen of Death for me! This can however be subject to bug fixes in EQMod as later versions are released, if indeed this issue is fixable at all (as it could be an ASCOM problem to do with the communication with the hardware). Stellarium is a wonderful program because it is very functional, very stable, it looks great and it is free. Unfortunately, it only supports a number of mounts for a direct connection to them. 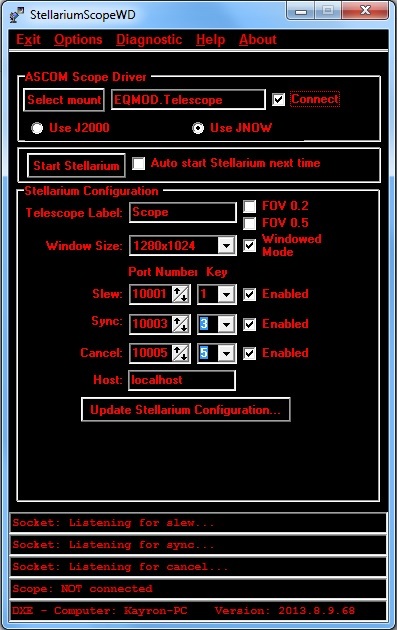 Currently as of version 0.14.1, it does not support ASCOM-connected mounts and so for this, we need a third-party program called StellariumScope. 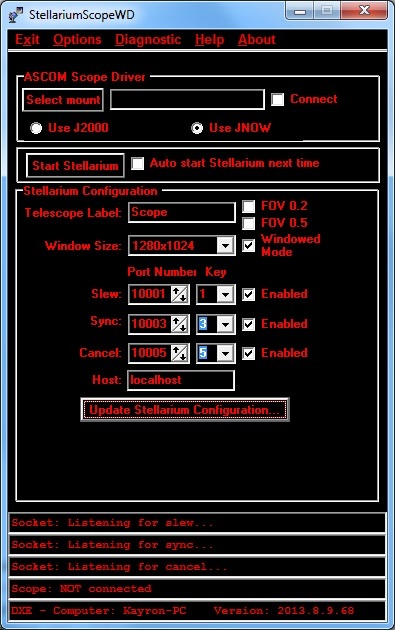 StellariumScope is a program that configures Stellarium, connects to your ASCOM-connected mount and runs Stellarium. This gives Stellarium the necessary support for ASCOM-connected mounts. 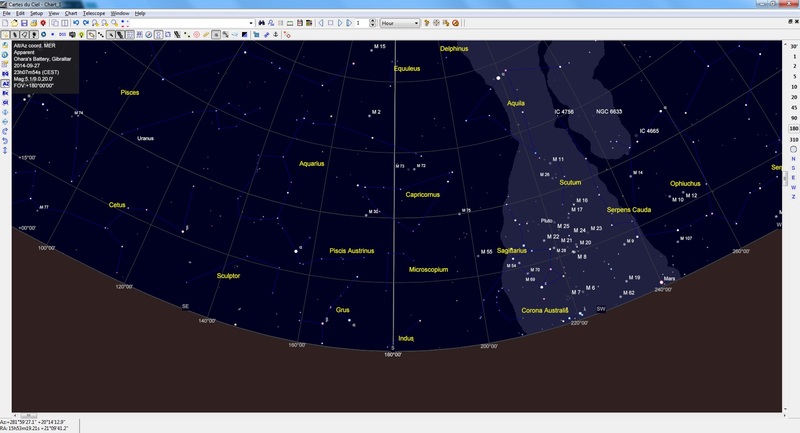 Stellarium can be downloaded for free from the Stellarium website (click Windows 32-bit link at the top). At the time of writing this tutorial, the latest version is 0.14.1, and this is fully supported by the current version of StellariumScope, which is 2015-12-02 Beta. StellariumScope is downloadable for free from the StellariumScope website (scroll down to the latest release link). 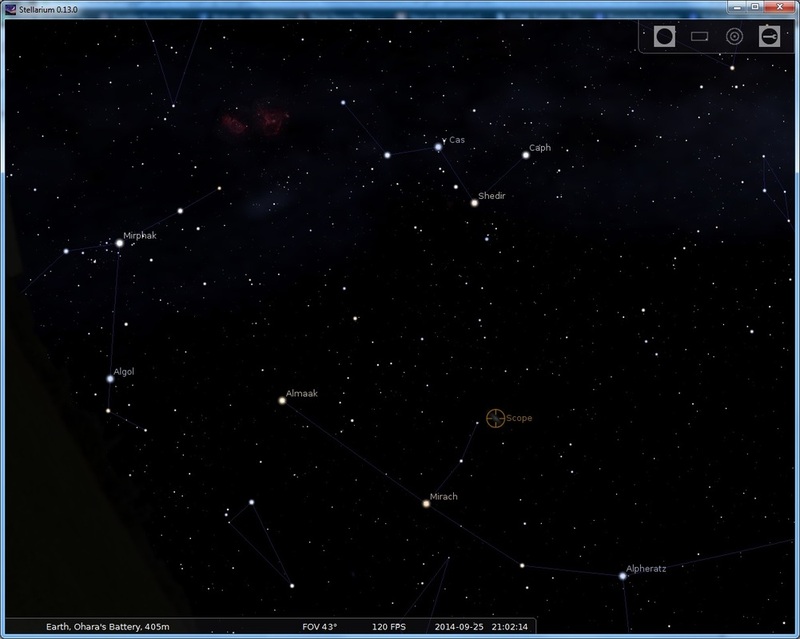 If you find there is now a new version of Stellarium but no new version of StellariumScope advertising support, it may still be worth testing to see if they are compatible. If they are not, you can always download Stellarium 0.14.1 by looking at the older releases list (find 0.14.1 on the list). 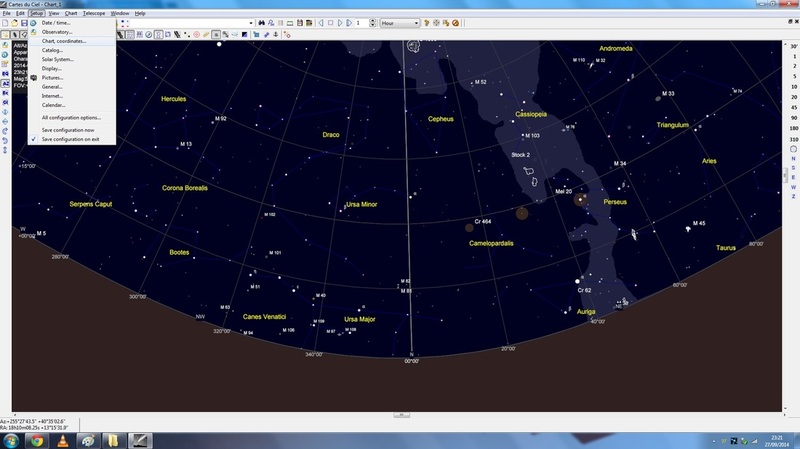 ​Once both are downloaded, install Stellarium first and then StellariumScope. 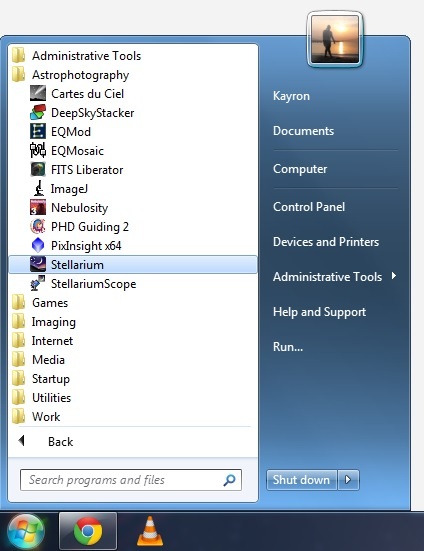 When you first install Stellarium, you need to start it up by itself once in order for it to create the necessary configuration files needed (that StellariumScope will modify). 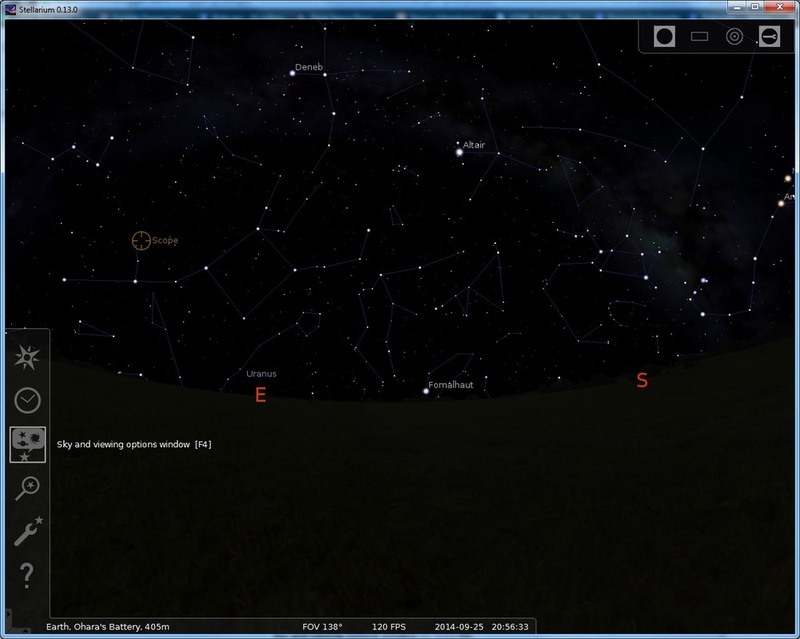 Simply run Stellarium once and once it is open, close it. 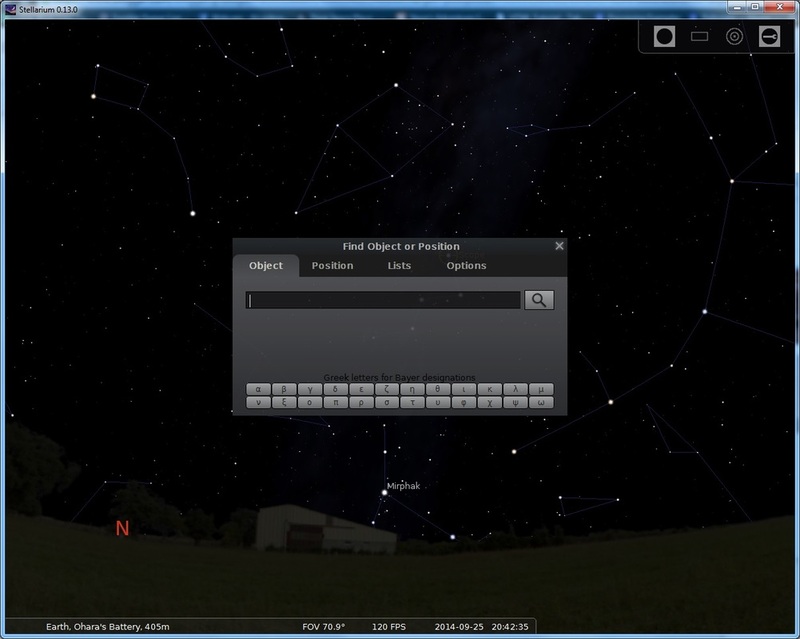 With Stellarium now closed, we may start StellariumScope. You will be greeted with an error at first. This error is normal and it is just telling you that StellariumScope will need to reconfigure some Stellarium configuration files in order for this to work at all. 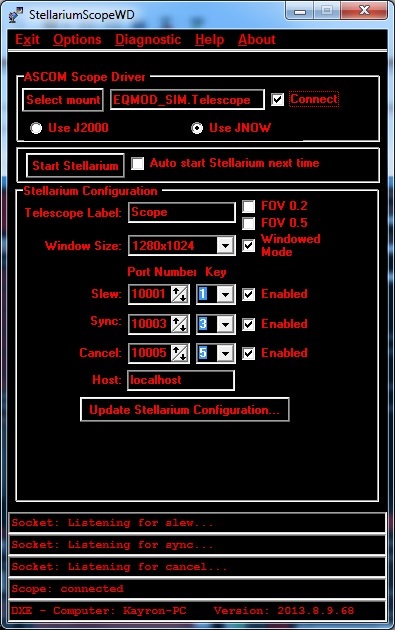 Simply click OK to confirm this and let us inspect the StellariumScope main window. It is very important that the Enabled tickboxes for Slew and Sync are ticked to enable these commands. Cancel would also be useful but I never personally use it. You may select a numerical key from the list for each, though the defaults work very well. Please note that you will have to press CTRL on your keyboard prior to the corresponding numerical key, e.g. to slew to a target, you select the target and press CTRL 1. 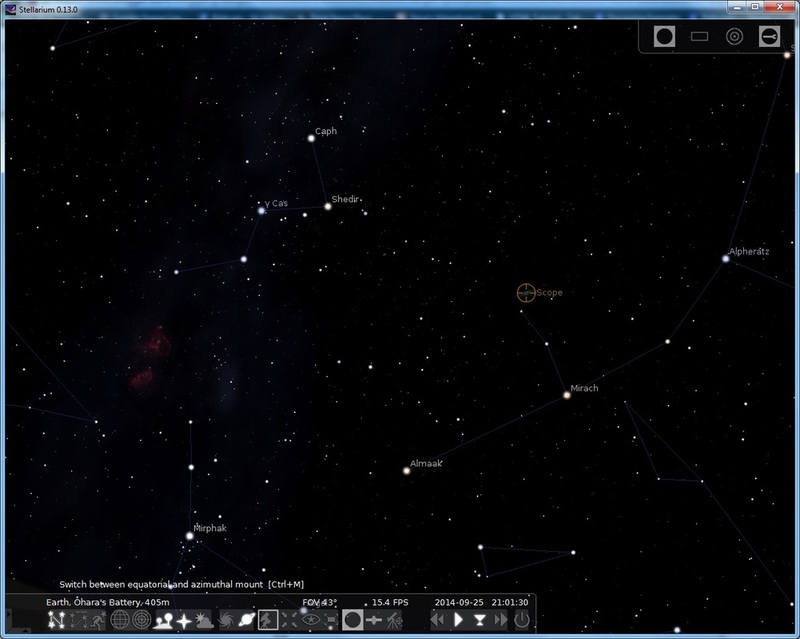 You may also wish to force Stellarium to start in Windowed Mode and at a particular resolution, since full-screen can be in the way when you want to control multiple programs. In any case, you can switch between Windowed Mode and Fullscreen Mode when in Stellarium and the window for Stellarium can also be manually resized to your liking. Once your settings are set, click the Update Stellarium Configuration button on the bottom and click Yes to all prompts that pop up. The message on the bottom (below the bottom) should then disappear once done. 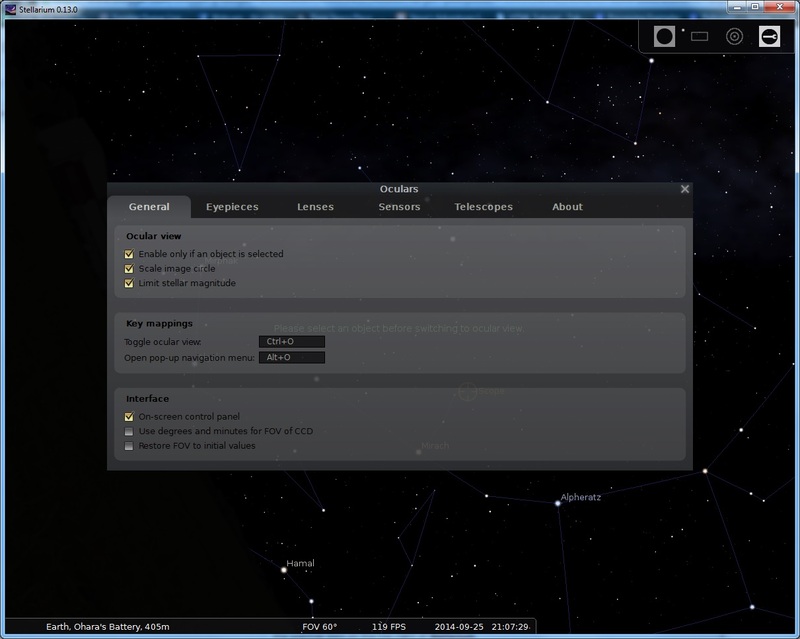 Now that Stellarium is properly configured to work with StellariumScope, all we need to do is select our mount and connect to it. For this, we click the Select mount button on the top-left. 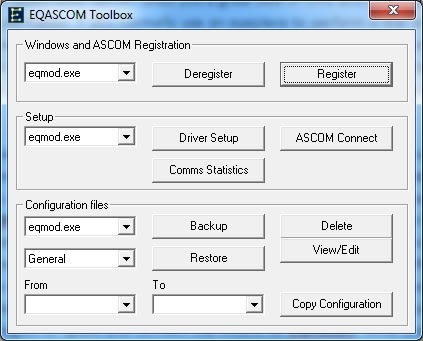 After this, we get the standard ASCOM pop-up for selection, which provides a list. Depending on what you have installed (e.g. the EQDirect cable) and how you connected your mount (e.g. directly or through the hand controller), this list will list a couple of devices. In my case, the EQMOD ASCOM HEQ5/6 is the correct choice as this relates to my mount and the EQDirect cable. You may have the exact same item listed. Interestingly, below is EQMOD ASCOM Simulator. We will not use this at this point but this will be the subject of discussion later. 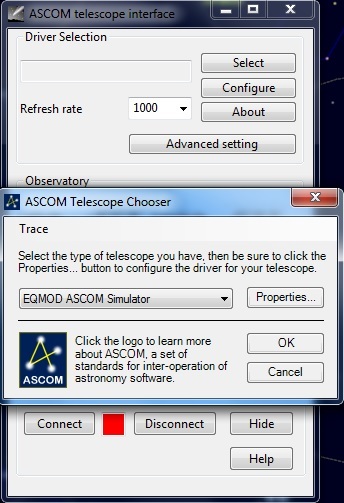 Once EQMOD ASCOM HEQ5/6 is selected, we click OK. StellariumScope now states EQMOD.Telescope for selected mount. In order to connect, we click the Connect tickbox. Now that StellariumScope is fully configured and connected to the mount, we click the Start Stellarium button and Stellarium starts normally. 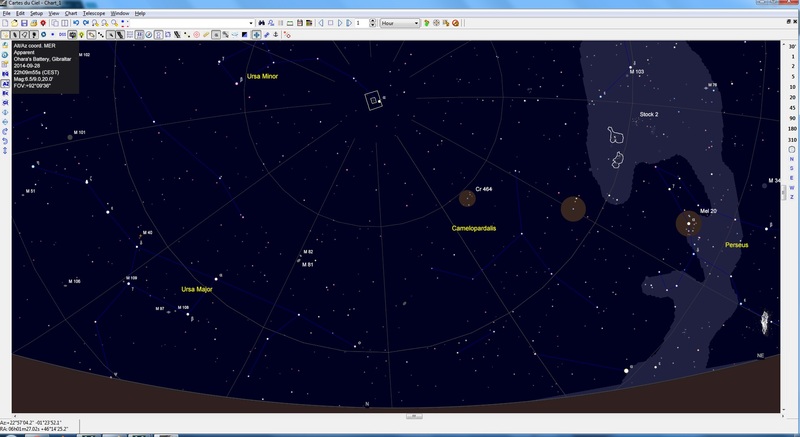 There is however a difference now - visible if we look North in Stellarium. The crosshair Scope now visible in Stellarium is quite literally your telescope, which is currently in the Home Position, pointing North with the counterweights down and the telescope upright. Ensuring the mount is unparked in EQMod, all we need to do now is select a star in the night sky and press CTRL 1 on the keyboard to watch the mount slew. Once a Goto command is issued to slew to a target, the mount will automatically track that target for as long as you keep it there. Other targets in Stellarium can be selected and searched for and the mount will keep tracking the target you issued a Goto command on. If you are performing a star alignment process to make Goto slews more accurate, simply slew to a star of your choice in Stellarium. Once the mount is tracking, go to EQMod and use the North, South, East and West slew controls to centre the star in a crosshair (through a finderscope, an eyepiece or a camera). Once you have centred the star in view, you will notice Stellarium will show the Scope crosshair off-target, which is normal as you have physically slewed the mount off-target (in Stellarium's perspective). 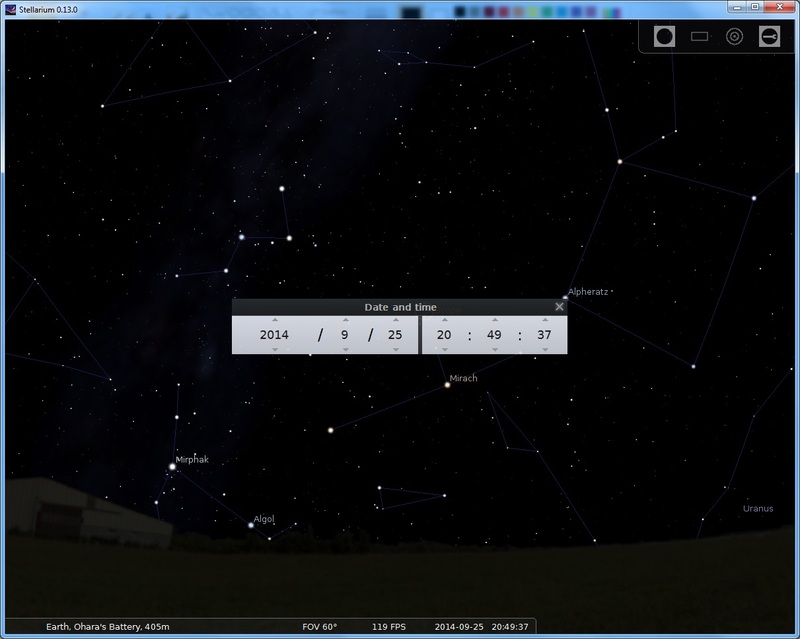 To tell Stellarium that actually you are perfectly on-target now, press CTRL 3 on Stellarium. This will issue a Sync command that will centre the Scope crosshair in Stellarium over your target, so that what you see through the telescope agrees with Stellarium and at the same time, add an alignment point to EQMod. This means that future Goto commands will now be more accurate. You can repeat this process on as many stars as you like to make Goto commands increasingly accurate. Please note however that if you switch off the mount (or simply disconnect EQMod), this alignment data will be lost. 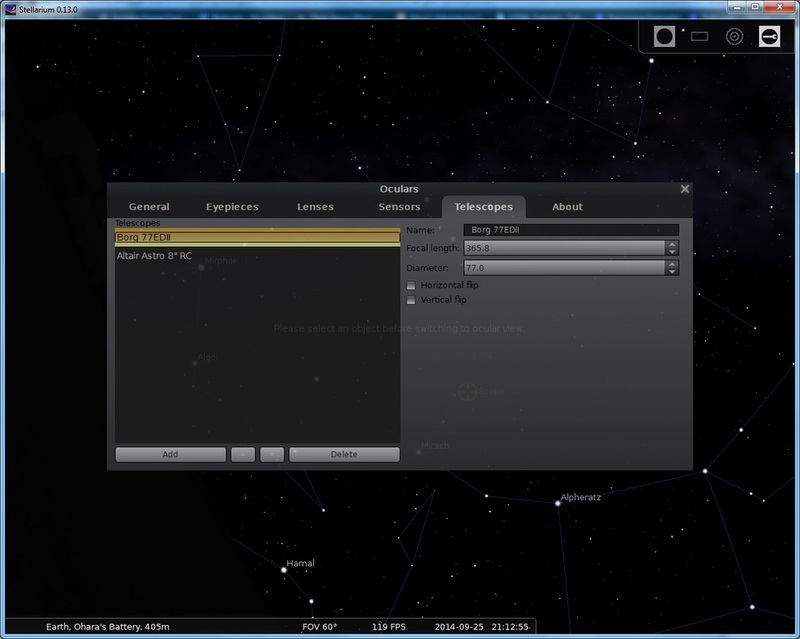 An important thing to note before proceeding with any Goto commands or alignment, is that you need to set the GPS location on Stellarium to match EQMod's. 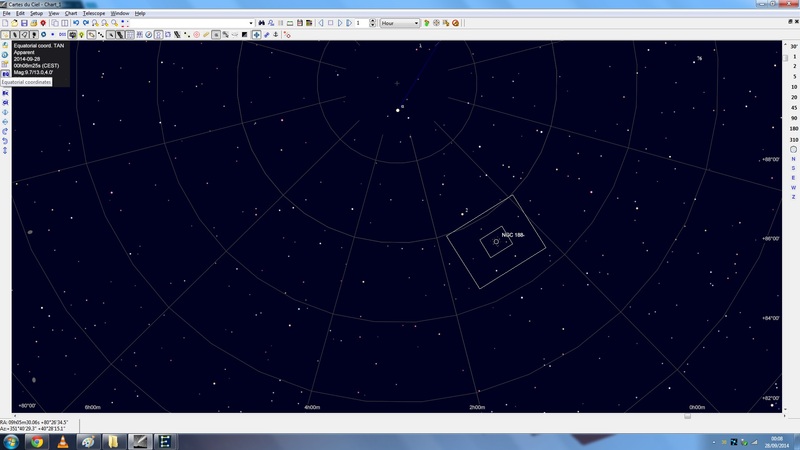 Check what GPS location coordinates you entered into EQMod and replicate this on Stellarium by hovering your mouse to the left of Stellarium and clicking Location window (or pressing F6). You can use this to add a new location manually and make Stellarium use this as default location, which is great so you never have to set the location again whenever you start Stellarium. I find that unless I make a new location act as default, Stellarium will insist on setting the default installation location, which seems to be Paris, France (nowhere near where I live!). Once you are happy with the location setting, you can close this window. Whatever name you gave your location, will be visible on the bottom-left of Stellarium, so you get a quick glance when you start Stellarium if or not it is correctly configured from the start. For best viewing experience, I always turn off the atmosphere (press A) and enable constellation lines (press C). If you would like to search for an object in particular, simply hover the mouse over the left side of Stellarium and click Search window (or press F3). Here you may enter the name or catalogue code of known targets. 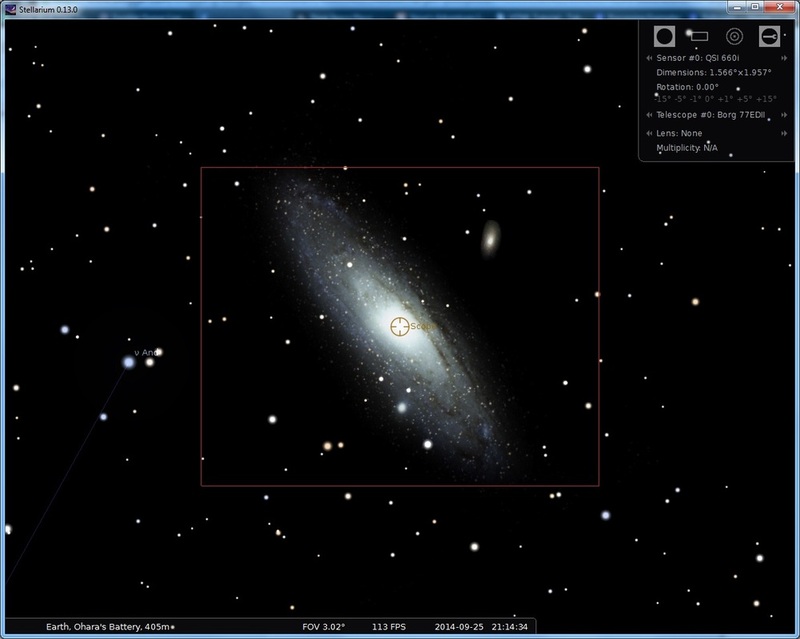 If it is found, it will be recalled below the text box in bold text, as shown below for the Andromeda Galaxy. The second screenshot above shows the target selection after having zoomed in by scrolling the mouse wheel up. Issuing a Goto command is now as simple as pressing CTRL 1 and the mount slews to Andromeda Galaxy. 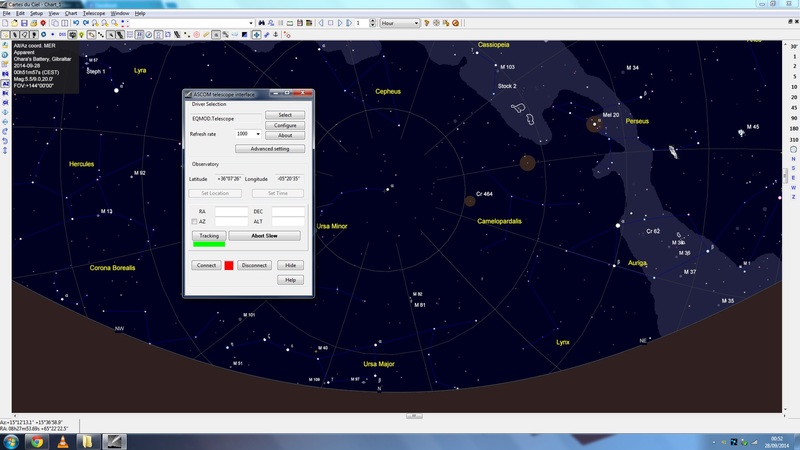 Other simple but useful functions are available in Stellarium. For example, if you click to select a different target in view, such as a star or another nebula/galaxy, and wish to centre this in view, simply press SPACE after clicking to select it. You may also toggle the ground by pressing G, in order to gaze how far below the horizon a certain target may be. 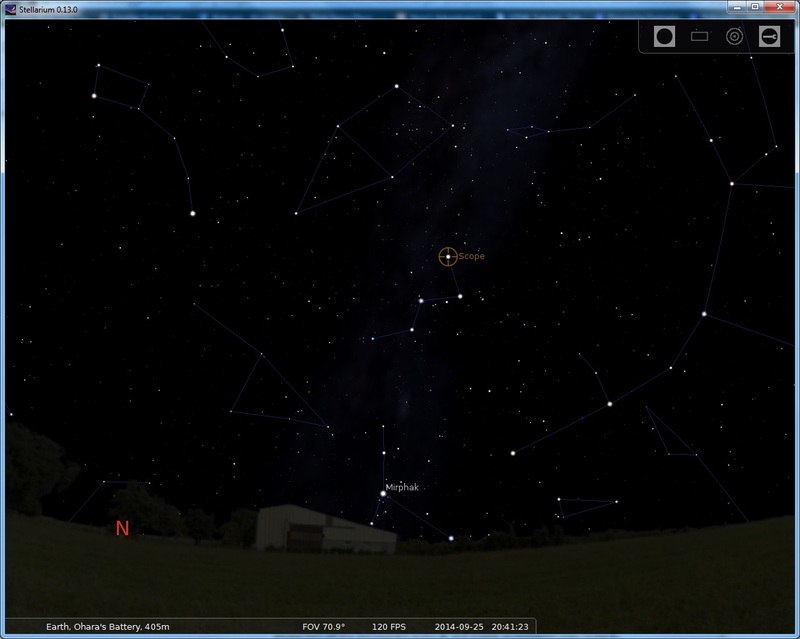 You may also hover the mouse over the left side of Stellarium and click Date/time window in order to set a date and time in the past or future. This is very useful in order to quickly gauge where a certain target will be in relation to the night sky on a certain date and time. The ground visible in Stellarium will also illuminate according to the Sun and the Moon, giving you a quick indication if there is astronomical darkness or not. The Moon's phase is also visible in real-time, which is visible by simply selecting the Moon as a target (search for it if you cannot find it) and zooming in on it. 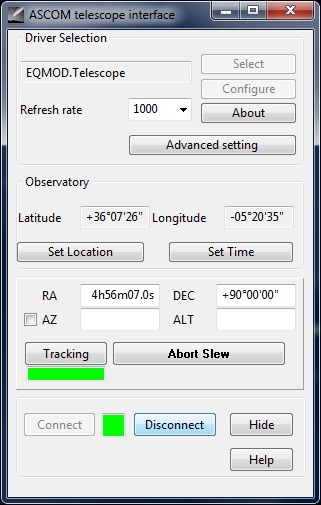 Also note that if you are interested in planetary viewing or astrophotography, that issuing a Goto command in Stellarium to a planet or the Moon will enable the relevant tracking rate automatically in EQMod, where Sidereal is used for deep space objects. The currently-selected tracking rate is visible in EQMod's window, just below the North, South, East and West slew controls. 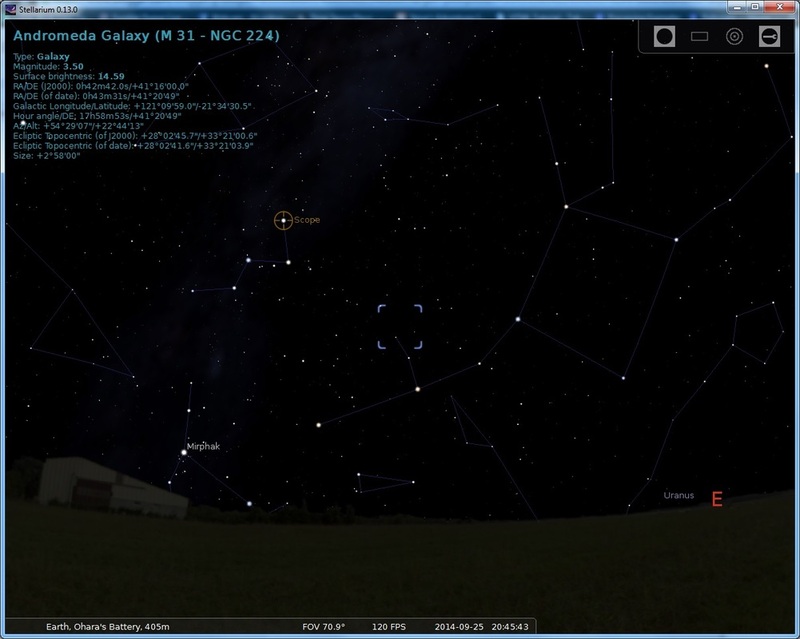 You may also enjoy enabling the Meridian and Equator lines in Stellarium, to get a quick glance as to where they are in relation to your night sky. This is fantastic if manually selecting stars for drift alignment, for example. To enable these, hover the mouse over the left side of Stellarium and click Sky and viewing options window (or press F4). In the window that pops up, click the Markings tab. 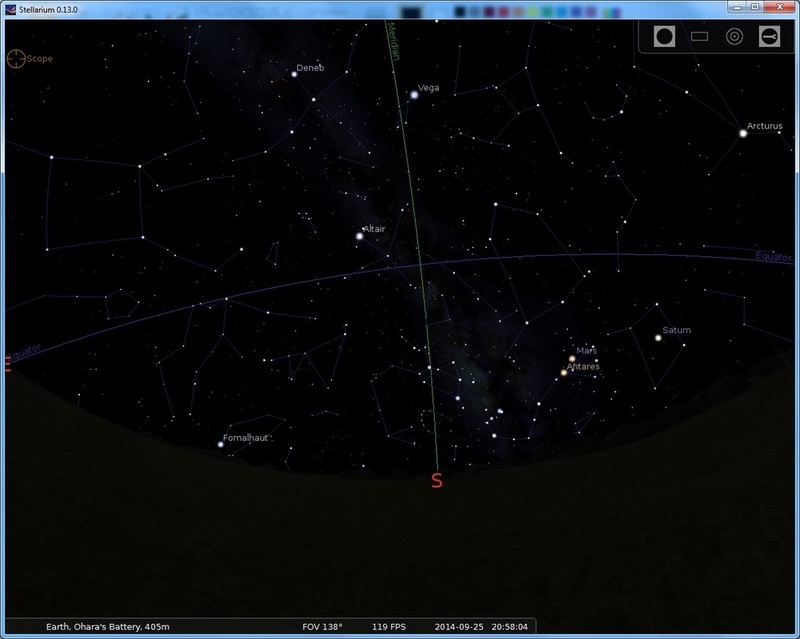 Enabling Equator and Meridian and closing the window now displays these lines on the night sky. 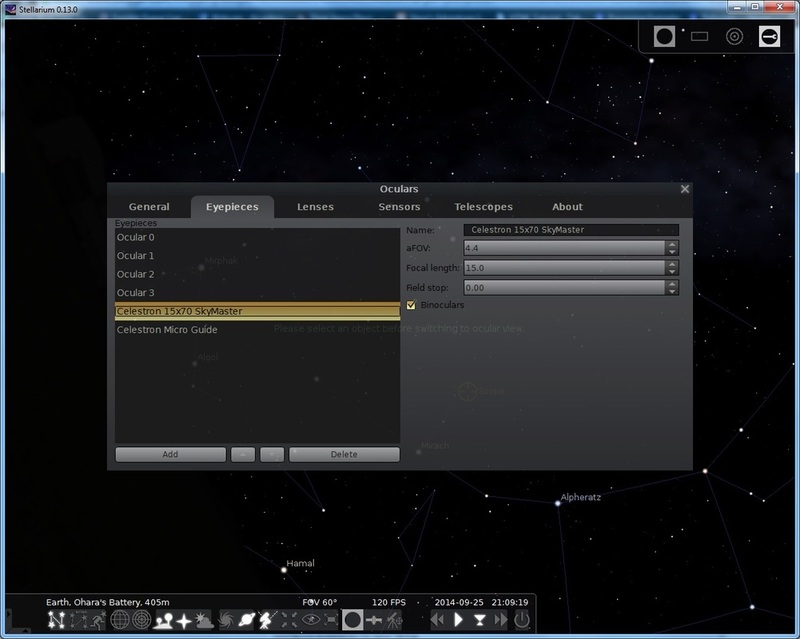 There are other display options to enable/disable, such as displaying markers over deep space targets such as nebulae and galaxies. 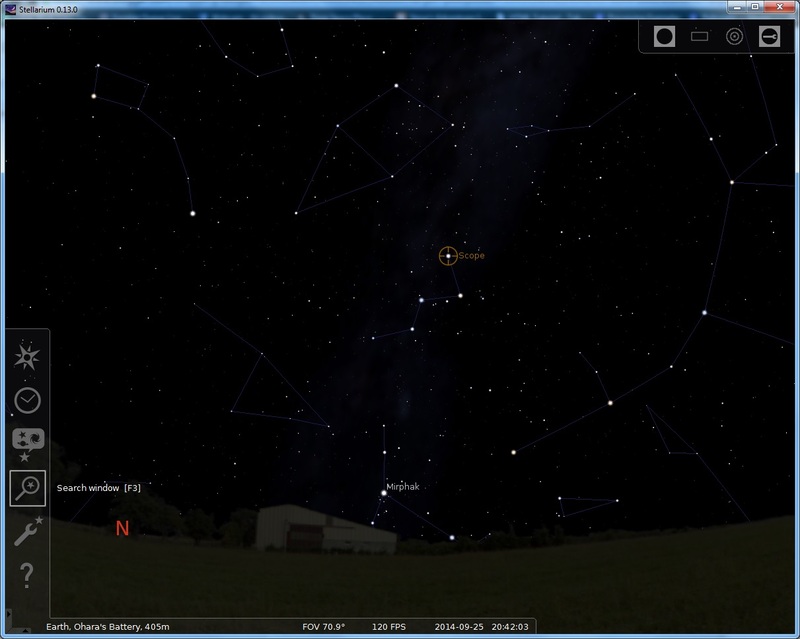 Two further interesting features (mainly for astrophotography) exist in Stellarium however. The first I will go over is Equatorial Mode. Hover the mouse over the bottom of Stellarium and click Switch between equatorial and azimuthal mount (or press CTRL M). You will notice the view is now tilted. Stellarium is now in Equatorial Mode, so you are seeing the night sky as your telescope sees it when mounted on an equatorial mount. Scrolling through the night sky can be a little awkward is this mode, but you can quickly switch between modes by pressing CTRL M in any case. Equatorial Mode is interesting when coupled with the second interesting feature - Ocular Mode. If you are interested in adding eyepieces for viewing, you can go to the Eyepieces tab and add and configure eyepieces to your liking. You will of course also need to add and configure your telescope. However, the subject of this tutorial is mainly focused on astrophotography so we concentrate on the tabs for Telescopes and Sensors. I personally added both my imaging telescopes under Telescopes and my CCD camera under Sensors. Once added and configured, we can close this window. 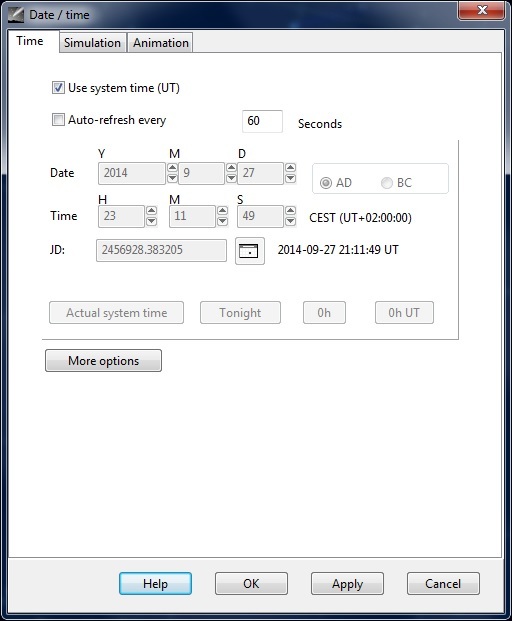 These settings will be kept by Stellarium even when you close it. 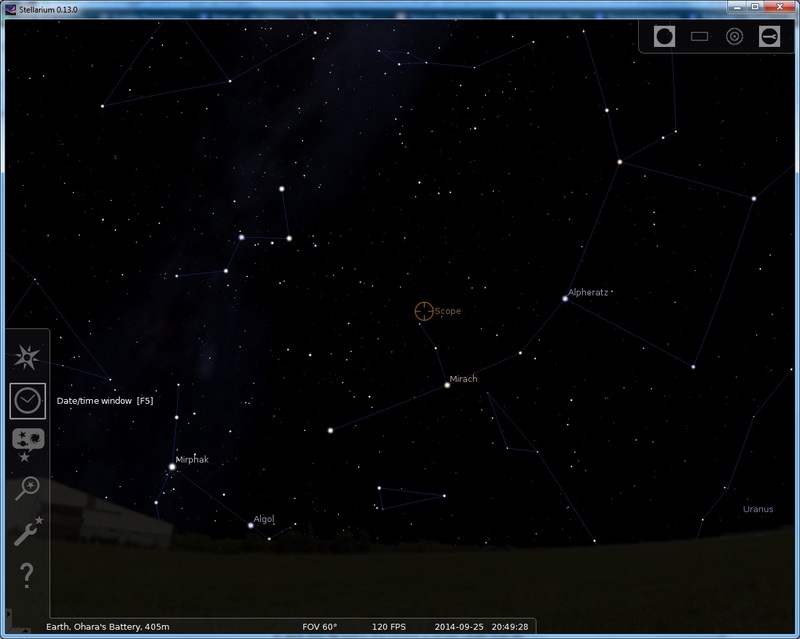 To enable the Ocular Mode for the camera, we simply click the rectangular icon on the top-right of Stellarium (third from the right side). 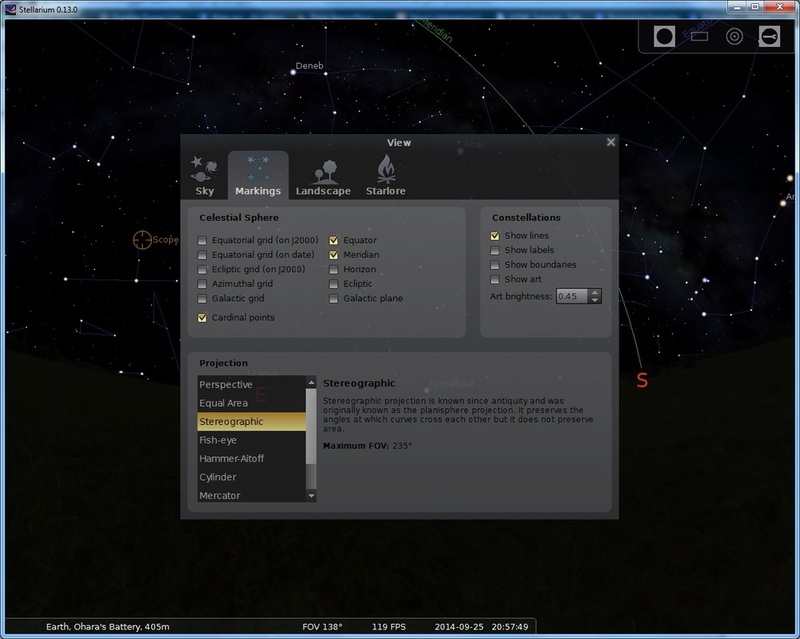 The information pop-up on the top-right of Stellarium tells us the field of view dimensions and also allows us to select a different camera and/or telescope, as per those listed on the configuration we just played with. The great thing about this is that not only are we seeing the exact field of view of the camera through the telescope as a rectangle, but also the orientation of the target in the field of view (having enabled Equatorial Mode). We can click the numbered angles on the information pop-up on the top-right to angle our field of view rectangle however we like. Below shows the field of view for the same target but with my other imaging telescope and also with the camera angled 90°. Overall this feature is tremendously useful for planning and to get a quick glance as to what the camera will actually see, specifically related to particular targets of interest. It is also a great tool to work with mosaics. 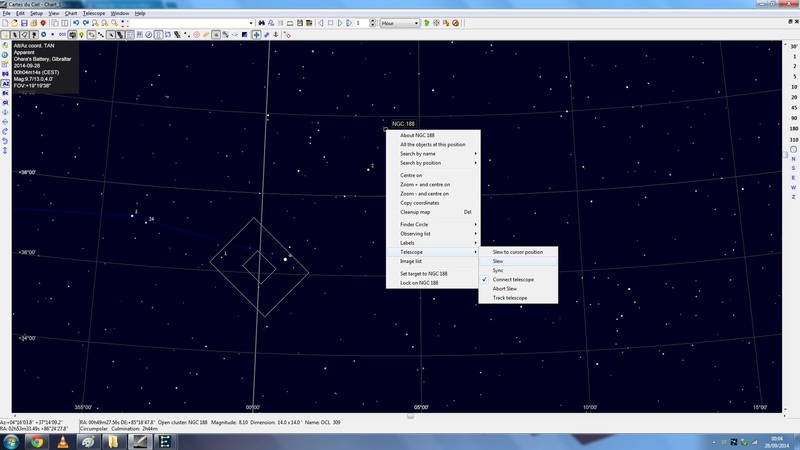 We can go back to the original view by simply clicking the rectangle icon button on the top-right of Stellarium again to disable Ocular Mode and pressing CTRL M to disable Equatorial Mode. A word of warning is that at present (as of version 0.14.1), it is not possible to tell the mount to slew to a specific area of the night sky by selecting it and issuing a Goto command. As a result, you can only slew to actual targets visible - stars, nebulae and galaxies. This can make it difficult to precisely frame multiple targets, if there is no central star you can select, for example. Cartes du Ciel can actually do this as it allows you to right-click anywhere on the night sky and instruct your mount to slew to that precise location. Ultimately this is the end of the guide on how to work with Stellarium. Please see section 3.2 if you wish to explore how to work with Cartes du Ciel. 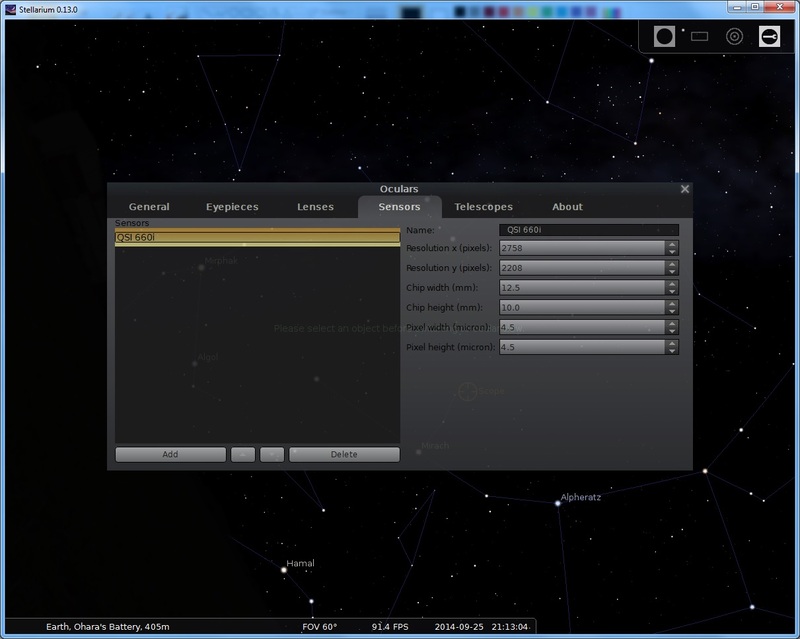 Once you are done with Stellarium, you can simply close its window. 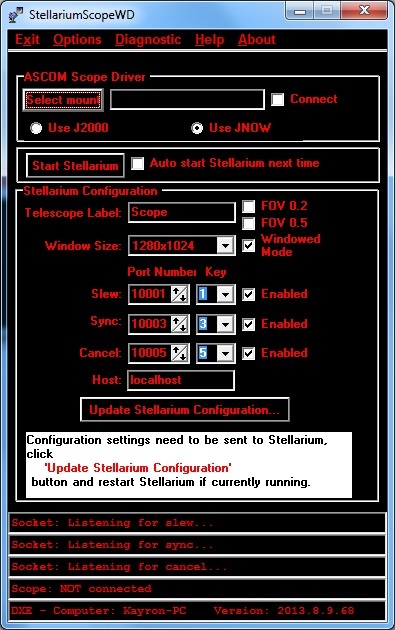 Then, click the Connect tickbox in StellariumScope to disconnect the mount. You can then close StellariumScope. 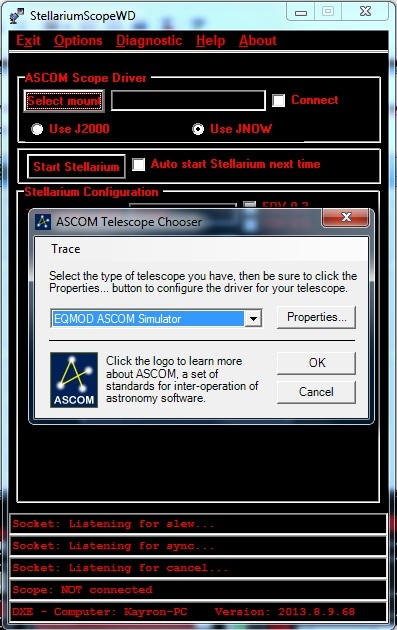 To pack up, click Park on EQMod and once the telescope is back in the Home Position, go to EQMod's Toolbox and click ASCOM Disconnect. You can then close EQMod's Toolbox and pack away all your equipment. Cartes du Ciel is generally as functional as Stellarium, and even more so, though arguably less nice to look at. It is however more popular than Stellarium in terms of how many people choose to use it. This could be partially due to the fact that Cartes du Ciel supports ASCOM-connected mounts straight out without any third-party software. Thankfully as well, Cartes du Ciel is as free as Stellarium. Also, despite the name, the program is by default available in English. 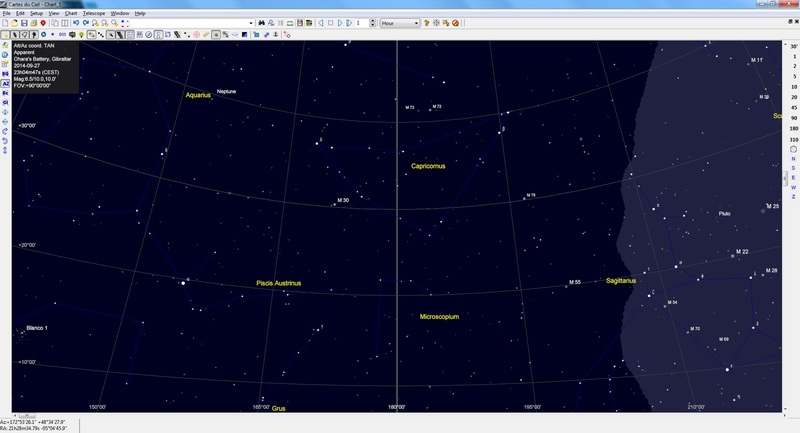 Cartes du Ciel can be downloaded from the Cartes du Ciel website (click Windows Setup link at the top, under the Skycharts title). One would however benefit from not just downloading the actual program, but also the Star Catalogs, DSO Catalogs and DSO Pictures, available lower down that same page. 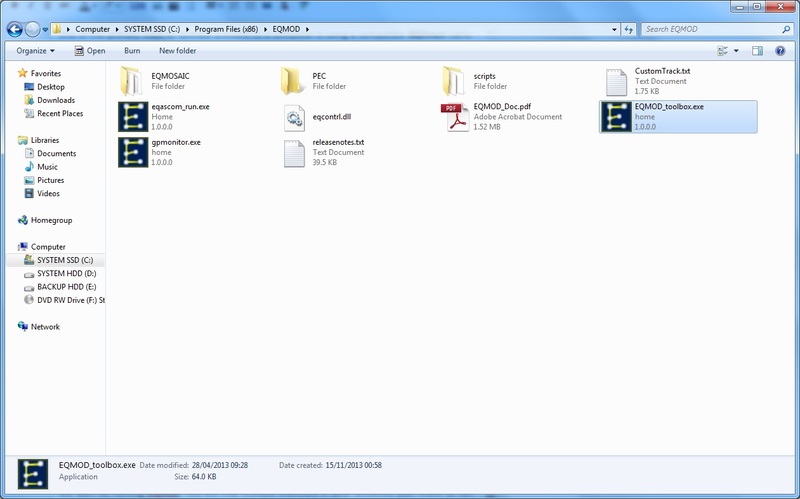 In total, you will have four installation files once everything is downloaded. Please ensure you install Cartes du Ciel (the actual program) first and then the other three in whichever order you like. Once all four installations are done, the program will be ready for configuration and use. ​Assuming EQMod is currently running with your mount connected to it, we can start Cartes du Ciel for the first time. 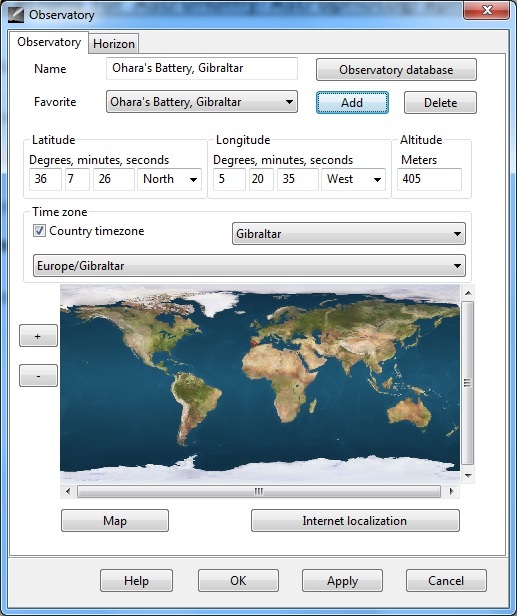 Initially, you will be greeted with a window asking about your observatory (site location). This should be configured right away so that your site location is entered. Simply type in your desired site name under Name, set your site's GPS coordinates and altitude, select the correct country on the list for the timezone and click the Add button to add it as a favourite. You can add multiple favourites at this stage so you can quickly switch between sites whenever you start Cartes du Ciel, though this can also be done at a later stage. Simply make sure the GPS coordinates you enter here match those entered in EQMod. With the site added, we simply click OK and Cartes du Ciel starts for the first time. 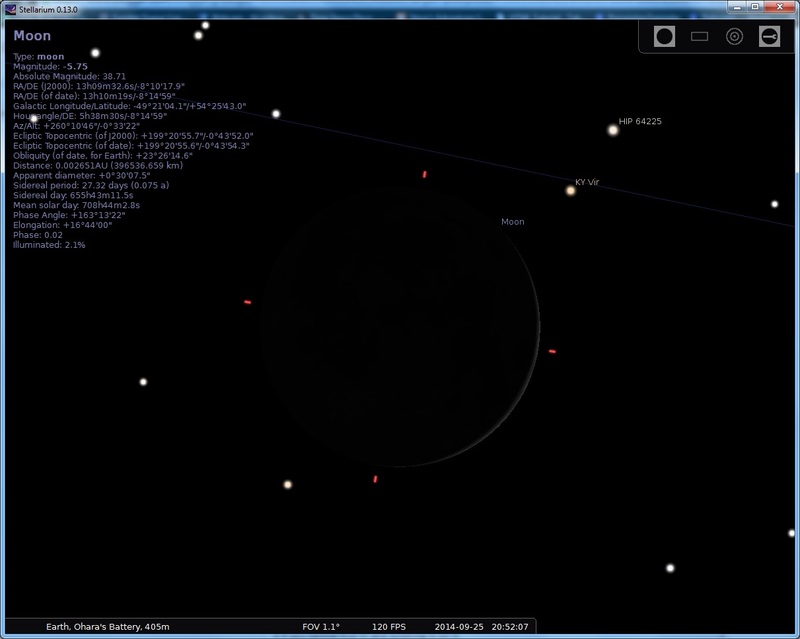 If you are familiar with Stellarium, you will note how cluttered Cartes du Ciel looks compared. 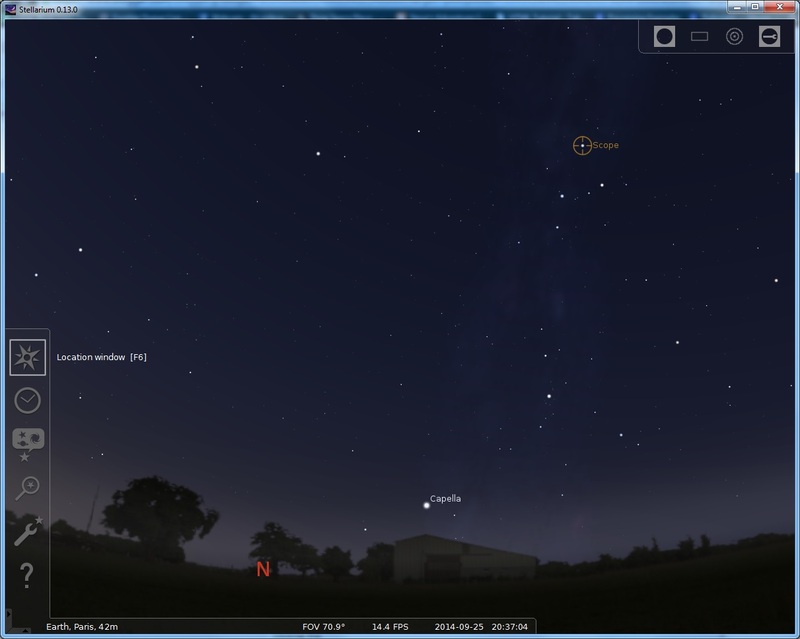 This is partially the reason why I prefer to use Stellarium when I can. 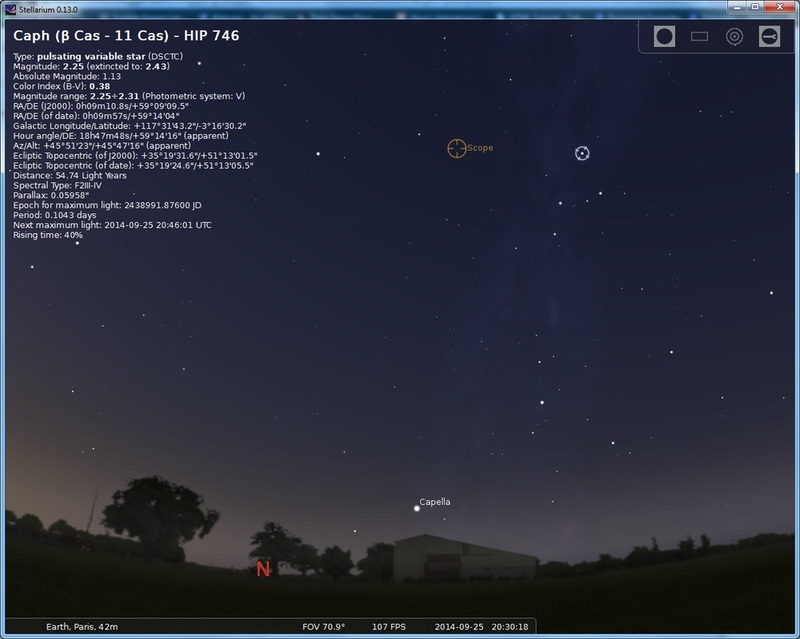 If you have read through section 3.1 above however, for Stellarium, you will know by now that Cartes du Ciel has extra functionality in that it can slew your telescope to any location in the night sky, even areas without any cataloged stars. 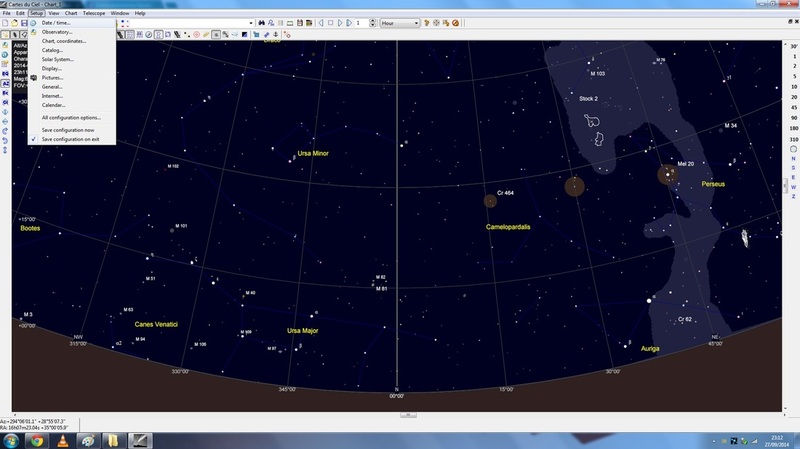 Stellarium cannot do that at this stage (as of version 0.14.1), so it is at times worth using Cartes du Ciel if you are trying to frame targets very precisely. Note-worthy at this stage are a couple of buttons around Cartes du Ciel's interface. 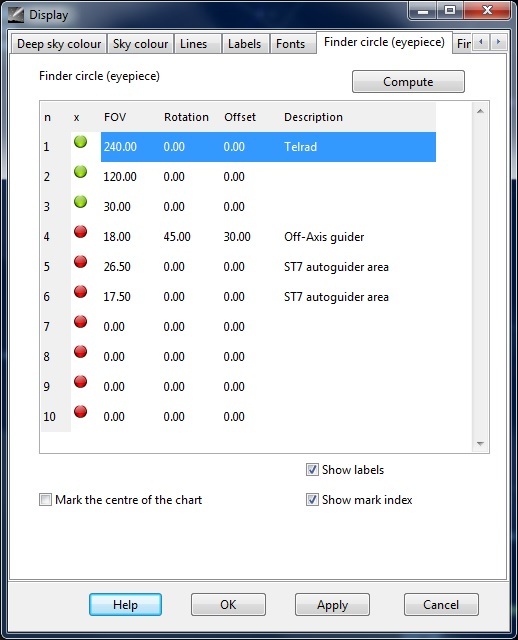 To the very right, you will see a list of field of view values. 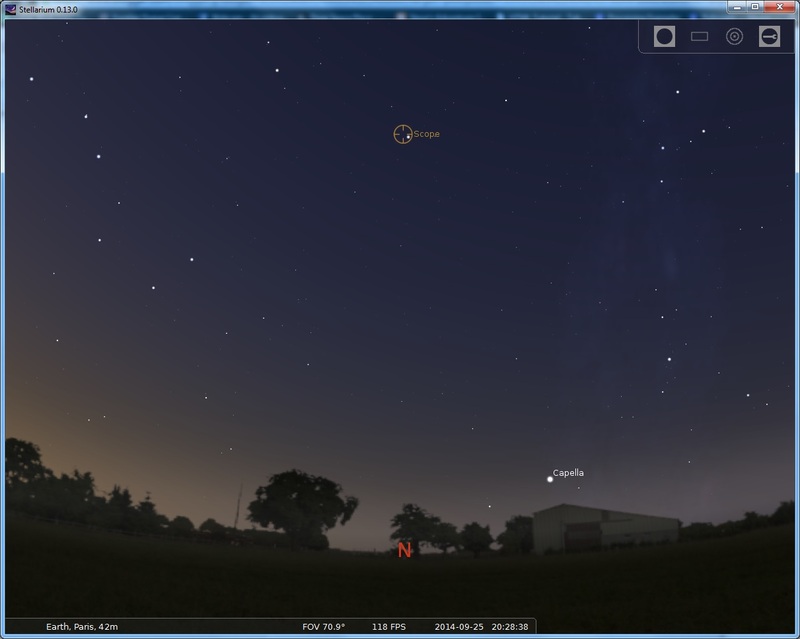 These are quick shortcuts to zoom in and out of the night sky view. For example, clicking 180 shows half the night sky (180°). At the bottom of the list you also have N, S, E, W and Z which is to quickly rotate the night sky view to a particular direction (Z represents the Zenith - looking straight overhead). This can all be done manually though. If you have a mouse (i.e. 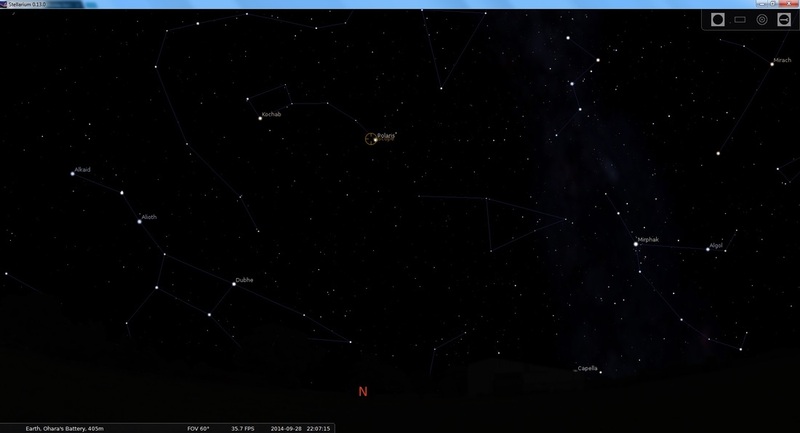 not using a laptop's touchpad), you can press the mouse wheel down (using it as a button) and while pressed, drag across the night sky view to rotate the view. You can change this by clicking the Change mouse mode button along the toolbar just above the night sky view (clicking it allows you to rotate the view of the night sky simply by keeping the left mouse button pressed and dragging). Scrolling the mouse wheel up and down zooms in and out, respectively. By default, the night sky view on Cartes du Ciel does not update over time. To enable real-time updates, go to the Setup menu at the top and click Date / time. Having set your site location with the correct timezone, we need not worry about that. By default, when Cartes du Ciel starts up, it seems to use the system time (your computer's time setting) to set the night sky in view. For this reason, you must make sure the computer you are using is displaying the correct time. If you are using Cartes du Ciel to plan your session, you may wish to uncheck the Use system time (UT) option in order to enter a particular date and time to see the past or future. However, please make sure this option is re-enabled afterwards. In order to enable real-time updating of the night sky, simply check to enable Auto-refresh every and enter a number of Seconds. 10 seems to be the minimum allowed by Cartes du Ciel, which suffices to make sure you have an updated night sky view as you search for targets. In any case, please remember that Cartes du Ciel will issue a Goto command to your mount and it will go to the correct coordinates anyway. Moreover, the mount will then start tracking the object continuously, so even if Cartes du Ciel's night sky view does not update, the mount will be on-target (subject to the mount's tracking performance, autoguiding, etc). Click OK on the window once you set your settings. We note at this stage that under the menu Setup, the item Observatory opens the window we encountered when we first ran Cartes du Ciel - the one where we can enter site GPS coordinates and save them as favourites. Please keep this in mind when wanting to add or delete sites as favourites. Earlier, the field of view buttons on the right side were mentioned as quick shortcuts. These shortcuts can actually be edited, by going to the Setup menu, clicking Charts / coordinates and going to the Field of vision tab. The above values are in degrees, so enter them accordingly if you wish to alter the shortcuts displayed on the right side menu of Cartes du Ciel. Click OK once done. An important configuration we should look at is the one that gives us the equivalent of Stellarium's Ocular View. This will be displayed by default when we connect to the mount and so it is a good idea to customise it first. Essentially, it will display rectangles overlapping the night sky corresponding to the field of view of the telescope with the CCD camera. It can also do this for particular eyepieces on telescopes (displaying them as circles rather than rectangles). To customise these display options, we go to the Setup menu and click Display. The two tabs we are interested in are the last two - Finder circle (eyepiece) and Finder rectangle (CCD). The red and green circles to the left of each item on the list control if they are physically displayed on the night sky view or not. These circles can be clicked to enable/disable them. Since I do not do visual astronomy, I disable all the ones under Finder circle (eyepiece). Since I have two telescopes that I image through with the same CCD camera, I only keep the first two under Finder rectangle (CCD) enabled. I also give them relevant names so they appear under the corresponding rectangles in the night sky view. 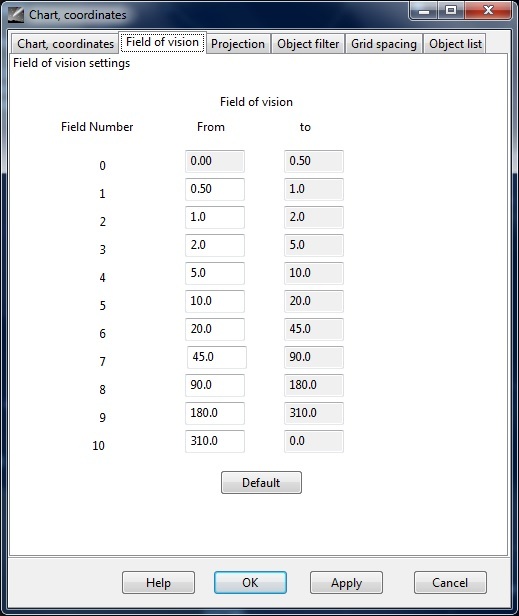 On clicking OK to this small Field of vision window, the relevant item on the list is updated with the correct field of view values computed. 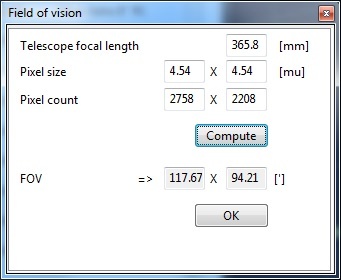 After doing both, the field of view values on Finder rectangle (CCD) are correctly entered. You may notice however that one of the default items on the list has an Offset value entered. This value literally shifts the field of view. Commonly, this is not the case and so this value is changed back to 0.00. Rotation is also left at 0.00 though this can be set to whichever angle you wish (perhaps while you plan your imaging of a particular target). Once all is configured, we click OK. It is now time to connect Cartes du Ciel to the mount. Assuming EQMod is already connected to the mount and it is running, we go to the Telescope menu and select Control panel. 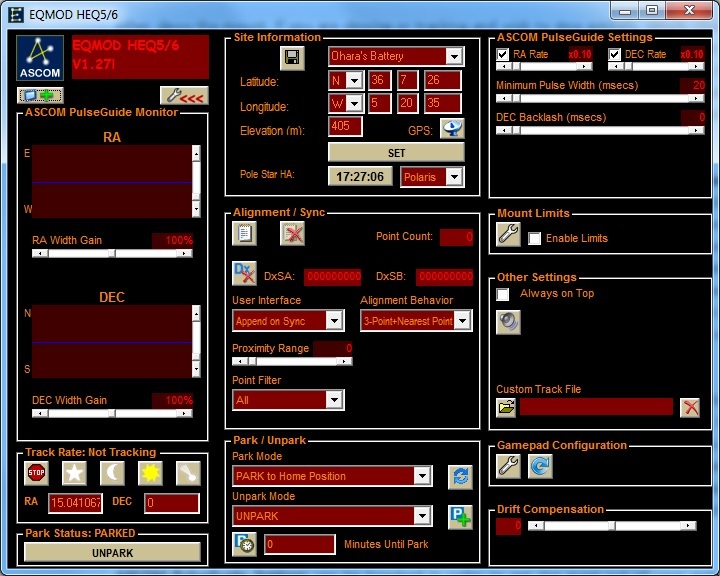 Here we first need to select the mount, so we click the Select button and the standard ASCOM selector window pops up. Depending on what you have installed (e.g. the EQDirect cable) and how you connected your mount (e.g. directly or through the hand controller), this list will list a couple of devices. In my case, the EQMOD ASCOM HEQ5/6 is the correct choice as this relates to my mount and the EQDirect cable. You may have the exact same item listed. Interestingly, below is EQMOD ASCOM Simulator. We will not use this at this point but this will be the subject of discussion later. 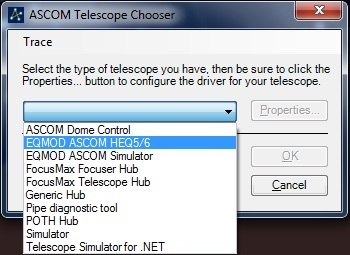 Once EQMOD ASCOM HEQ5/6 is selected, we click OK.
With EQMOD.Telescope displayed under Driver Selection, we need not do anything else except click the Connect button at the bottom-left of the window. This will connect to the mount via ASCOM. Once connected, the red square to the right of the Connect button will turn green. Right Ascension and Declination coordinates will also appear, generally showing the Home Position (these numbers are replicated from EQMod). We can close the window once the square next to the Connect button goes green. Now zooming in on the North in Cartes du Ciel, we see the finder rectangles showing the field of view of both my telescopes with my CCD camera. To the centre of these rectangles is where the telescope is pointing in its Home Position, as we connected to the mount for the first time. Each rectangle shows the field of view of each of my telescopes when paired with my CCD camera. Since I only have two, it is easy to tell which is which. Unfortunately there seems to be no way I can find to enable labels with the rectangle descriptions to be displayed under the corresponding rectangles. However, we can enable a pointer that always centres itself where you are looking on the night sky view and this pointer does have the labels on the rectangles (and eyepiece circles, if you added and enabled any). We will enable this pointer in a bit. At this stage, you now have full control of your mount through Cartes du Ciel. You can click to select any target in the night sky view and then right-click on your target, go to the Telescope menu and click Slew. You can also click to select the target and instead go to the Telescope menu along the top of the Cartes du Ciel window and click Slew there. Now that we are on-target, it would be a good idea to rotate the night sky view to Equatorial Mode, much like we did in Stellarium. This essentially rotates the night sky view so that you are seeing it as a telescope mounted on an equatorial mount sees it. 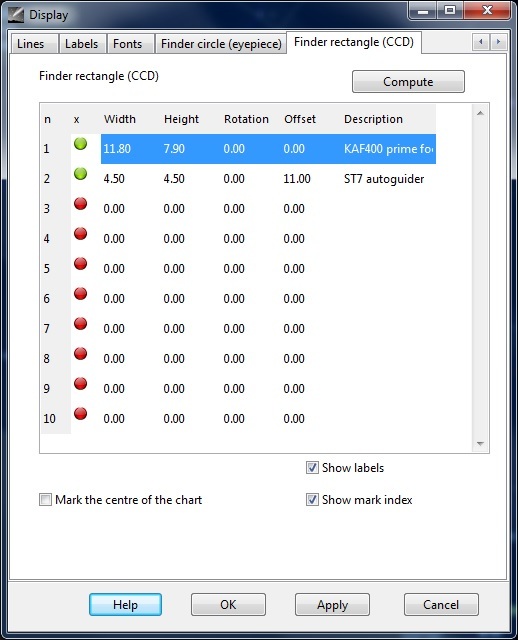 To do this, simply click the Equatorial coordinates button on the left list of buttons in Cartes du Ciel (icon says EQ). 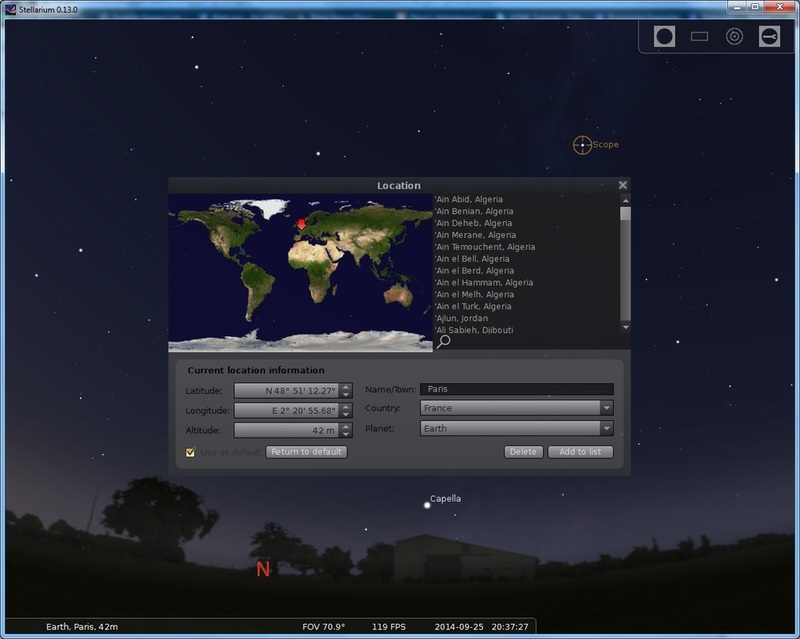 Instantly, the night sky view will be rotated to Equatorial Mode. 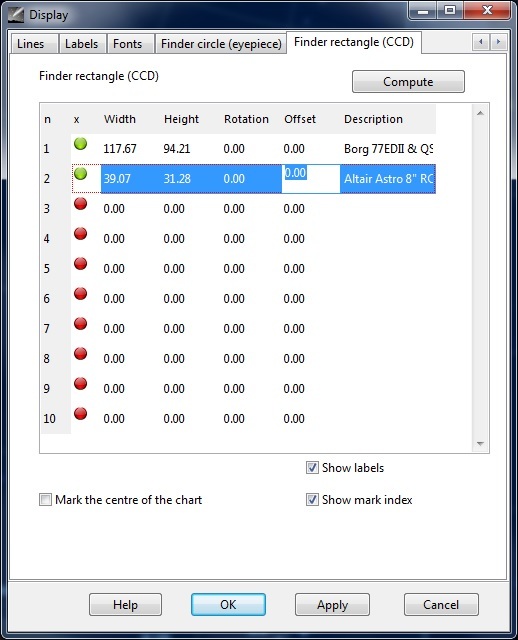 You can go back to Alt-Azimuth mode by clicking the button below it, called Alt-Az coordinates (icon says AZ). We now centre the target we are pointing to and zoom in. Providing the CCD camera is indeed at this angle, this is precisely what it would see through each of my telescopes. One should of course only need to pay attention to the rectangle relevant to the imaging system being used. If however you are having issues identifying which is which, simply because there seems to be no labels on the rectangles (or eyepiece circles), click the Show mark button along the top toolbar in Cartes du Ciel, just above the night sky view (the icon is a red bullseye). This is the pointer mentioned earlier. Though it follows your night sky view centre (essentially your mouse), it has the labels for each of the finder circles/rectangles in view and therefore provides a reference. If we wish to search for a target, rather than find it manually, we can use Cartes du Ciel's search function. In the most part, this is easily accessible through the text box on the top of Cartes du Ciel, just below the main menu. You can essentially type in an object catalog code (e.g. NGC6992) or common object name (e.g. 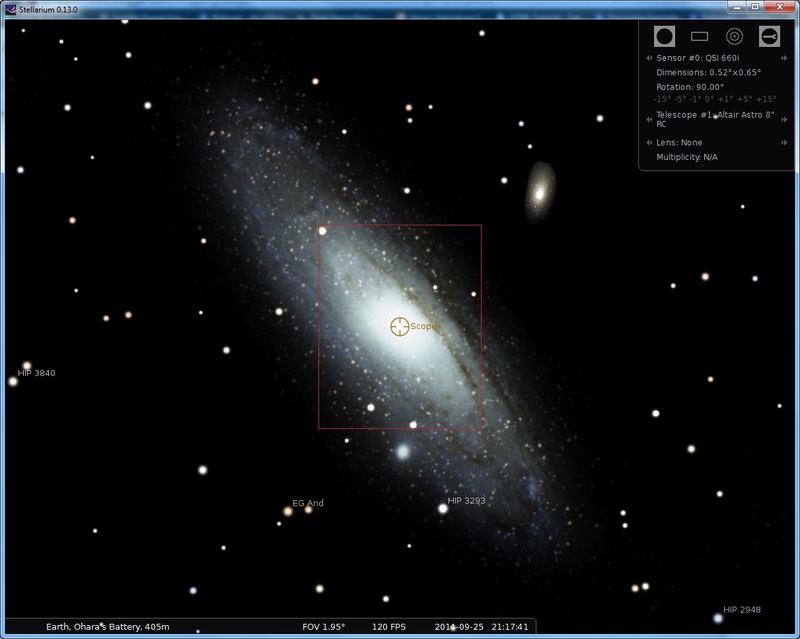 Andromeda Galaxy) and press ENTER to instantly rotate the night sky view to centre your target in view. We note however that the mount is not slewed at any point during this search. 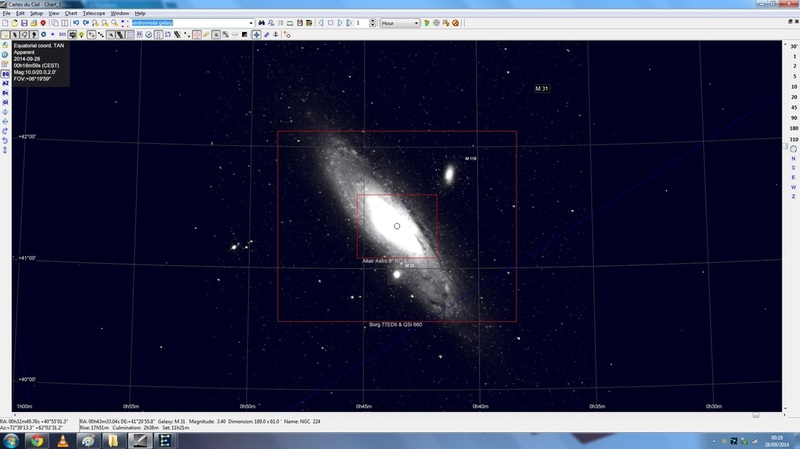 We have centred the Andromeda Galaxy in view, but the mount is still tracking the previous target (the one we gave a Goto command to). If you are having problems finding a target by name or catalog code, it may be worth checking Cartes du Ciel's Advanced Search. This is opened by clicking the button with the binoculars icon to the right of the search text box. Here you simply select a category (e.g. 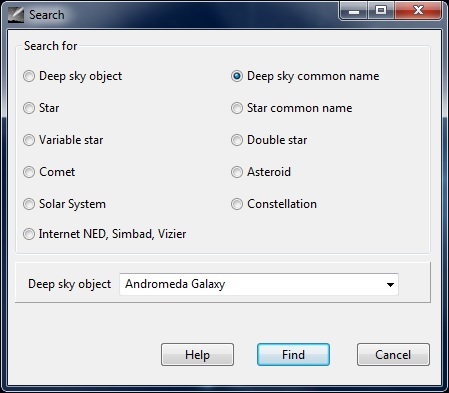 Deep sky common name) and then select from the relevant list or enter into the relevant field that appears below. Clicking the Find button instantly rotates the night sky view to centre the target found. Worth mentioning now is Cartes du Ciel's ability to slew the mount to any point in the night sky. To illustrate a good example, we find and look at the Leo Triplet of galaxies. Please note we have not yet slewed to this target, that we are still in Equatorial Mode and that I have rotated the finder rectangles to 90° (as I would my CCD camera) to frame the targets. The three galaxies just, just about fit into view with my longer focal length telescope. In Stellarium, you would have a problem here because there are no cataloged stars right in the centre of the three galaxies. All you can do is slew to one galaxy (or a nearby cataloged star) and then use EQMod's slew controls to manually frame the three galaxies as I have above. Fortunately though, Cartes du Ciel can slew to wherever you right-click in the night sky. To do this, I right-click right in the middle of my pointer, in-between the three galaxies, I go to the Telescope menu and then click Slew to cursor position (rather than Slew, which requires a target to be physically clicked to be selected). In the second screenshot above, I turned off the pointer so you can clearly see that the telescope is now pointing precisely to the centre of all three galaxies. This was done without any manual slewing. If you are slightly, slightly off-frame, you can make minor adjustments the same way, or you can opt to use EQMod's slew controls while monitoring the Cartes du Ciel window (to see the changes). This feature can at times be very useful, as is with the Leo Triplet, for example. 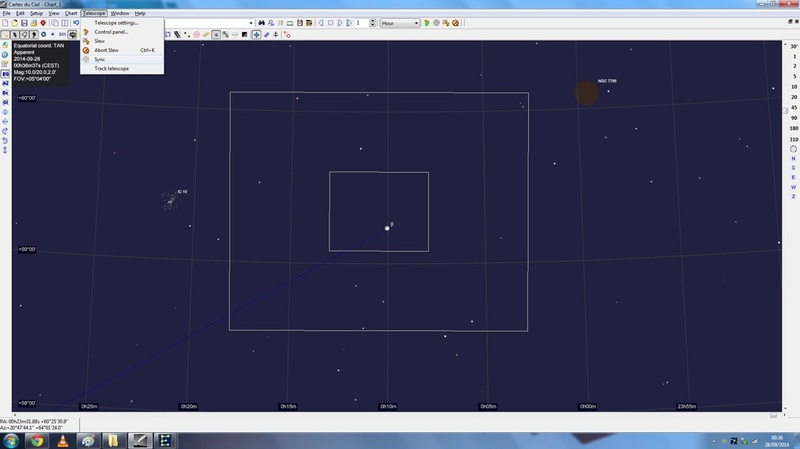 If you are performing a star alignment procedure, you can do this with Cartes du Ciel and EQMod just as you used to do with your hand controller. 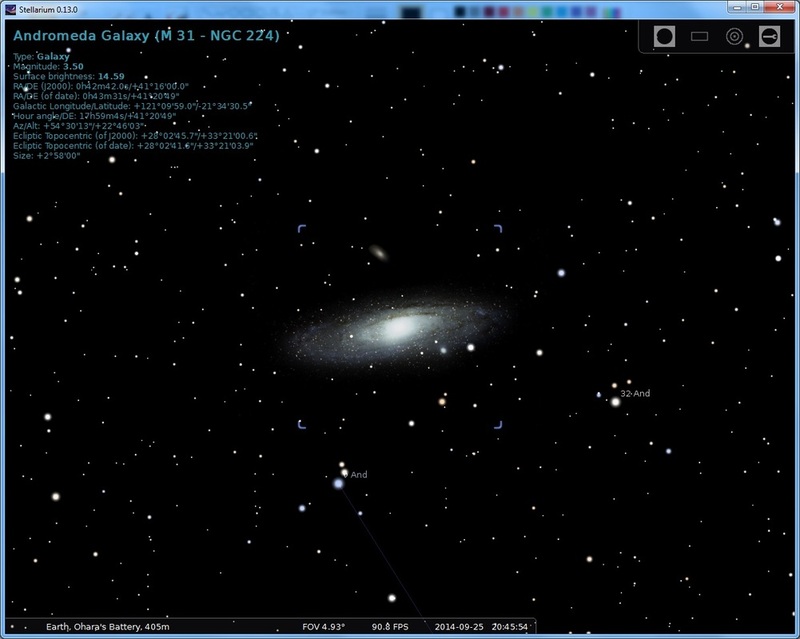 For this, simply click to select any star visible in the night sky view in Cartes du Ciel, issue a Goto command to slew to it and then look through a finderscope, eyepiece or CCD camera's view. 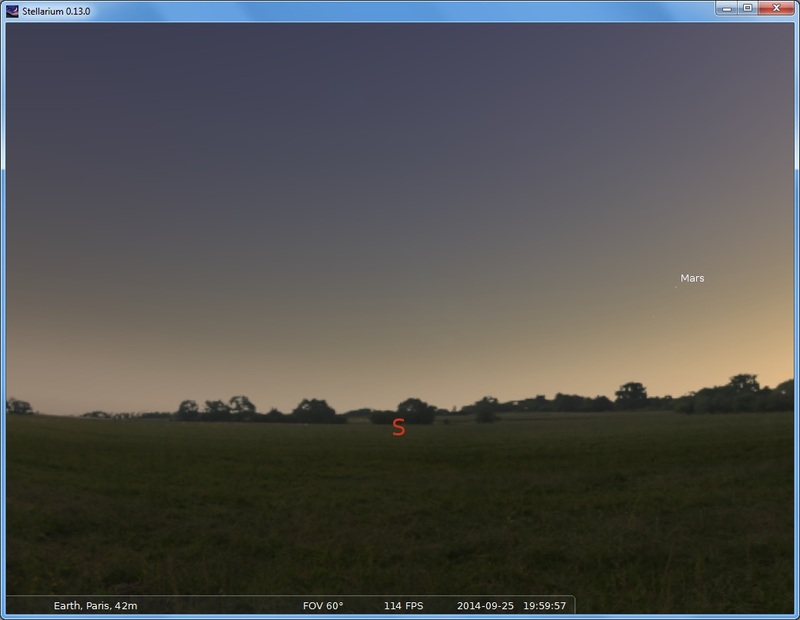 Use EQMod's slew controls to manually centre the star in view and then once done, you will notice the telescope marker in Cartes du Ciel will be off-target. This is normal because you have physically slewed the mount off-target from what Cartes du Ciel thinks is the star. 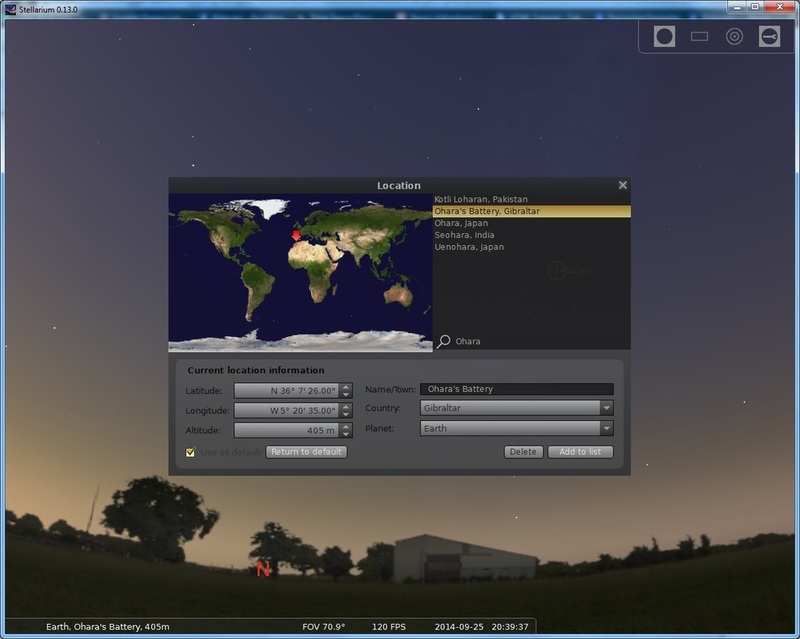 To synchronise Cartes du Ciel's night sky view to where your telescope is now pointing, simply go to the Telescope menu at the top (or right-click in the night sky view) and click Sync. Cartes du Ciel will ask you to confirm that indeed you are centred on the star selected in the night sky view and that you therefore wish to synchronise with it. 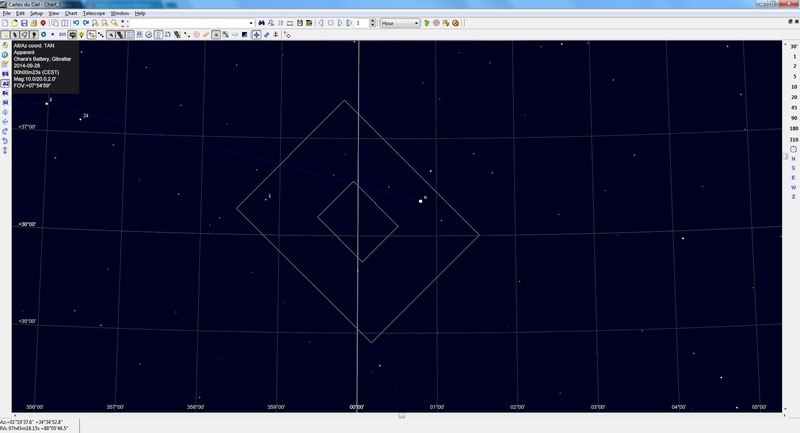 This will adjust Cartes du Ciel's night sky view to re-centre your telescope marker over the star. Additionally, it will add an alignment point in EQMod, which will make future Goto commands more accurate through the act of having performed this star alignment. You can do this with as many stars as you wish. 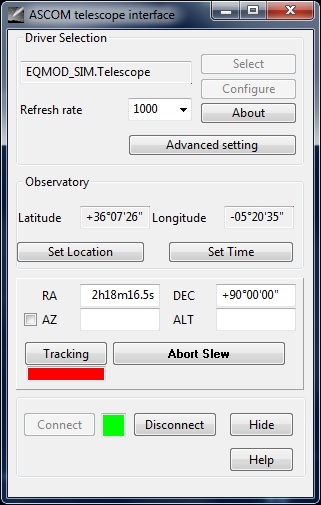 If you are interested in planetary viewing or astrophotography, note that issuing a Goto command in Cartes du Ciel to a planet or the Moon will enable the relevant tracking rate automatically in EQMod, where Sidereal is used for deep space objects. 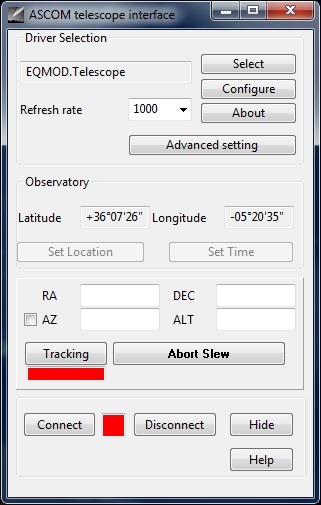 The currently-selected tracking rate is visible in EQMod's window, just below the North, South, East and West slew controls. 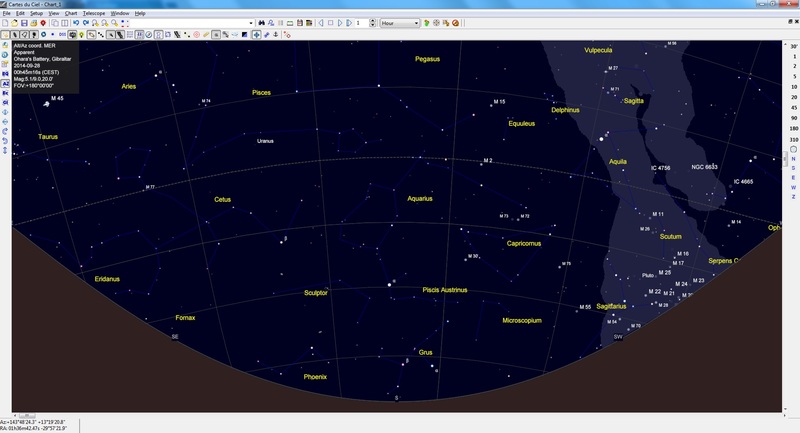 Finally, you may wish to alter the way the night sky view displays certain things, or add certain markers or lines. To do this, we simply go to the Setup menu on the top and then click Display. The tabs Display all the way to Fonts can change many aspects of how Cartes du Ciel actually looks. By default, I find it displays what I like to see - the Meridian and constellation lines, for example. You may wish to however remove the coordinates grid and perhaps add the Equator line. These options are available under the Lines tab. For example, to remove the coordinates grid, you just click to uncheck Show coordinates grid and to add the Equator, you just click to check Show equatorial grid. Under some, you get a drop-down menu, by default having Line selected. You can select from a multitude of options to show lines that are not necessarily bold and are instead broken or dashed. Above I did just that - disable the coordinates grid and enable the Equator (in dashed line fashion). Unfortunately Cartes du Ciel does not just display the Equator, it displays the entire equatorial grid. However, one can tell which is the actual Equator as the line is more bold than the rest and swoops East to West (see above screenshot), naturally. Once you are happy with how Cartes du Ciel is set up, please note that when you exit the program, it will ask if you wish to save changes. You need to answer Yes in order for the settings to be saved. You can save them right away by going to the Setup menu and clicking Save configuration now. You may wish to always answer Yes if prompted when exiting, just in case, unless you have a good reason not to save changes (e.g. you may have altered something you did not want to alter and do not know how to change it back). Ultimately, once you are finished with your session, you would normally click Park on EQMod to park the telescope back to the Home Position. Once this is done, you can disconnect Cartes du Ciel from the mount. To do this, simply go to the Telescope menu and click Control panel. Here, simply click the Disconnect button on the bottom. Doing this will make the green square beside the Connect button go red again, and the telescope marker in the night sky view will disappear. You can then close the window and actually close Cartes du Ciel as well (keeping in mind what was said above about saving changes to the settings). Now that Cartes du Ciel is closed, you can click ASCOM Disconnect on EQMod's Toolbox, close that, power down the mount and start packing up your equipment. Having computer-control of your mount is a very big deal. It unlocks many features that the hand controller cannot possibly provide. Already you will have a full planetarium at your fingertips, with no object limits and with a full graphical, real-time representation of the night sky around you at your location. Moreover, star alignment will become significantly easier as you get to pick whichever stars you wish, from the real-time view of the night sky on the planetarium software (Stellarium or Cartes du Ciel), and perform the star alignment with however many stars you wish. The advantages of computer-control do not stop there however. Star alignment is all well and good when it comes to improving Goto accuracy for your mount. However, since the process is a manual one, it can be both time-consuming and not as accurate as actual calculations. This is where the idea of plate solving comes into play. There exists a program called AstroTortilla, which like the ones mentioned in this tutorial, is completely free. AstroTortilla is usable by anyone who has a camera (DSLR or CCD) on their telescope. What it does is quite amazing. You issue a Goto command to a desired star or imaging target and naturally, your target is off-centre (by however slight an amount) in the frame. AstroTortilla then captures an exposure with your camera, analyses the image and from it, calculates what it is you are actually looking at. From this, it calculates how far off you are from having your intended target perfectly centred in the frame and sends a slew correction command to the mount, which centres the target perfectly. The subsequent exposure then displays your target perfectly centred in the frame. Moreover, during this process, AstroTortilla issues a Sync command to EQMod, which effectively adds an alignment point (to act as a star alignment, making future Goto commands more accurate). This process can be done in a matter of a couple of minutes. The great thing about this is that you are performing an automated star alignment process, which you can repeat as many times as you wish with as many stars or indeed, deep space targets as you wish (including galaxies and nebulae). Best of all, you do not need to actually do it to more than your actual imaging target. This is because since you are only really interested in having your imaging target centred in the frame, you only need bother do it for that target specifically. The idea that you are doing this in an automated fashion saves you a great deal of time and adds a great deal of precision. It also saves you hassle, if you normally use an eyepiece to perform a star alignment and then set up your camera to replace the eyepiece once done (this process would need a re-balancing of the mount as well!). Additionally, using AstroTortilla adds repeatability to your imaging as you are able to precisely centre a target time and time again, night after night. This allows your exposures to be combined perfectly even if captured over the course of several nights. The extra capabilities provided by computer-control do not end there. Some targets are too big to fit in the frame of your camera and telescope. That or you may wish to image an extended region around your target. This is common for nebulosity. As part of the EQASCOM project, there exists another free program called EQMosaic. EQMosaic simply issues slew commands to your mount to move to adjacent mosaic segments. It does this by first calculating your exact field of view (provided you input some values) and enter a desired percentage overlap between mosaic segments (10% to 20% is ideal to ensure a reliable stitching job later on). 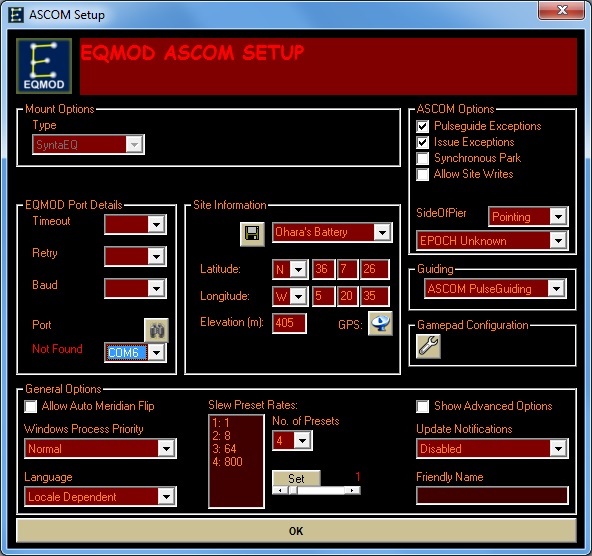 EQMosaic of course requires you are controlling your mount via ASCOM, whether you are using EQMod or another equivalent program. Essentially, you slew to your desired region of space and connect the mount to EQMosaic. Once the field of view values are configured, EQMosaic finds out where you are currently pointing through ASCOM and allows you to click adjacent boxes (in any direction) to produce mosaic segments from your starting point. Planning is key to understanding which adjacent boxes to go to for producing your desired mosaic. Additionally, EQMosaic allows you to save a session and on another night, load it. Loading the session issues a Goto command to your mount to slew to your target. You can then use AstroTortilla to make sure it is precisely centred in your frame and continue imaging your mosaic. 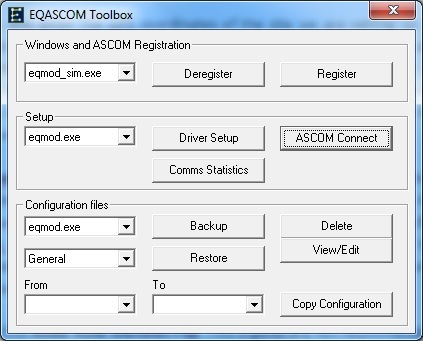 A final thing to mention is that ASCOM has a very useful ASCOM Simulator as part of its installation. This essentially allows you to connect to a simulated mount. The mount quite literally does not exist, but behaves identically to an equatorial mount connected to your computer via ASCOM. This allows you to play around with a lot of the software prior to bothering setting up physical equipment at your site. To initiate an ASCOM Simulator session, you need to run the EQMod Toolbox. 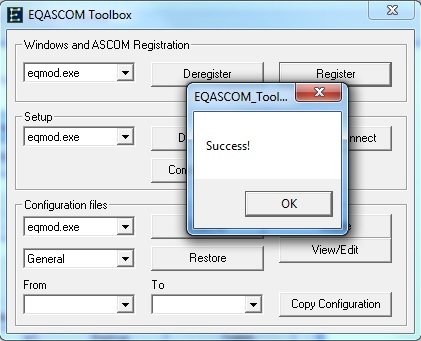 Rather than having eqmod.exe selected under Setup and clicking ASCOM Connect, we instead select eqmod_sim.exe from the list. We can click Driver Setup here again to carry out the configuration process as we did earlier with eqmod.exe. However, since this is a simulated mount, we need not bother with anything to do with COM port number. We can however set up our site's GPS coordinates, to simulate as if we were set up at our site. Once configured as desired, we click OK and then click ASCOM Connect. Like with eqmod.exe, this configuration need only be done once. The above shows EQMod running a session with the ASCOM Simulator. As aforementioned, it behaves identically to having an actual equatorial mount set up and connected. In fact, other software will think there is an actual equatorial mount connected. 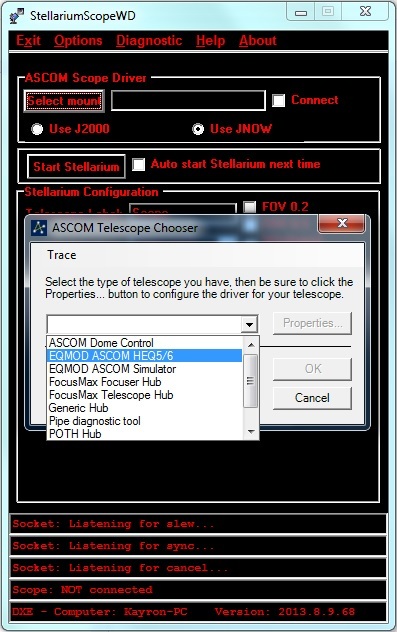 For example, the following shows me selecting the ASCOM Simulator in StellariumScope, connecting to it and starting Stellarium. The same applies in Cartes du Ciel - the behaviour is absolutely identical to a real equatorial mount. The actual benefits of having this ASCOM Simulator available become clearer as you gain more experience and experiment with software more. In general, being able to simulate your equipment is fantastic to test how things work together through ASCOM. The tutorial on producing deep space mosaics in fact makes extensive use of the ASCOM Simulator, for planning your mosaic segments at home during the day or a cloudy night. This saves a tremendous amount of time when you actually go out imaging as you can then set up and start imaging straight away.